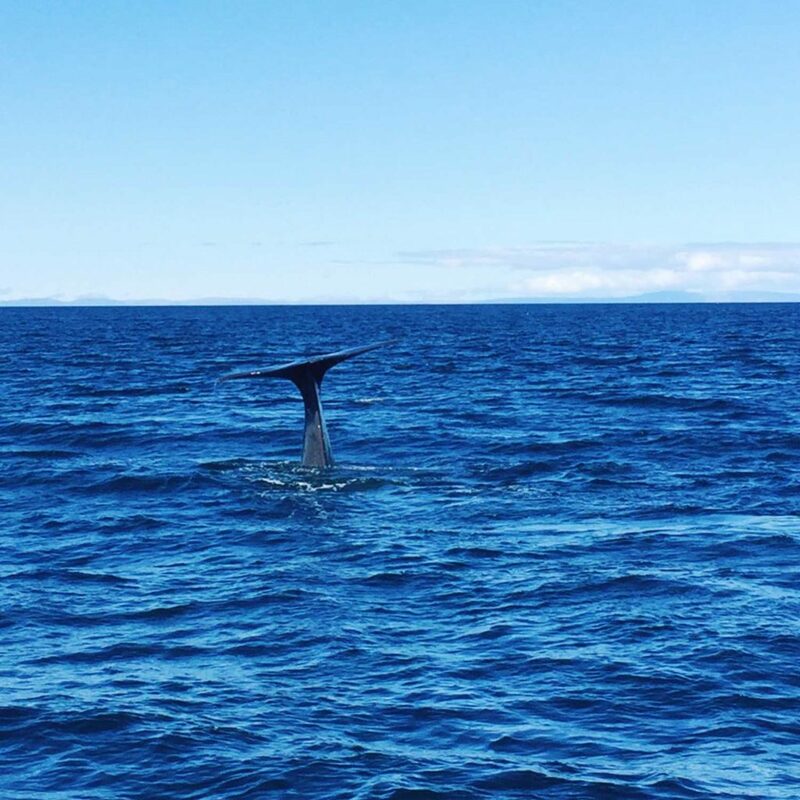 Volcanoes, geysers, black beaches and whale watching close to midnight: a summer whale trip to Iceland. 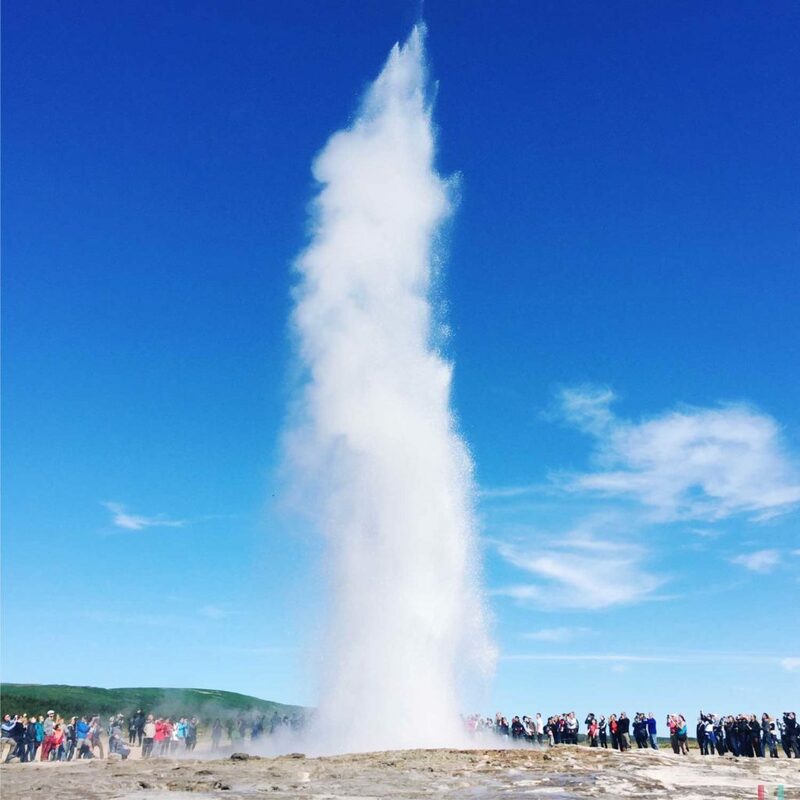 Volcanoes, geysers and whales close to midnight. 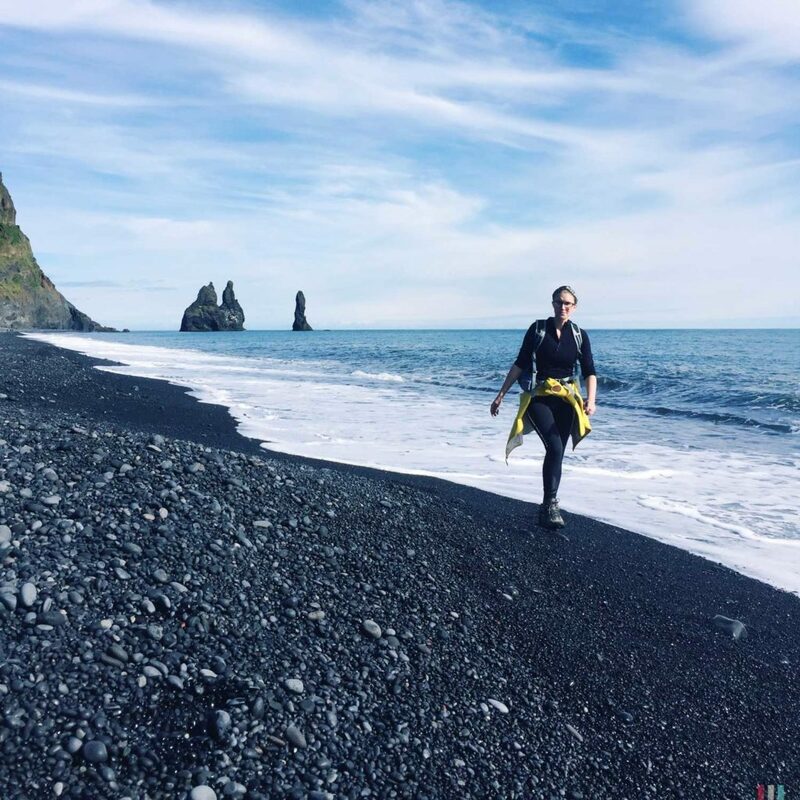 At the black beach of Reynisdrangar. With the goblins in the back. 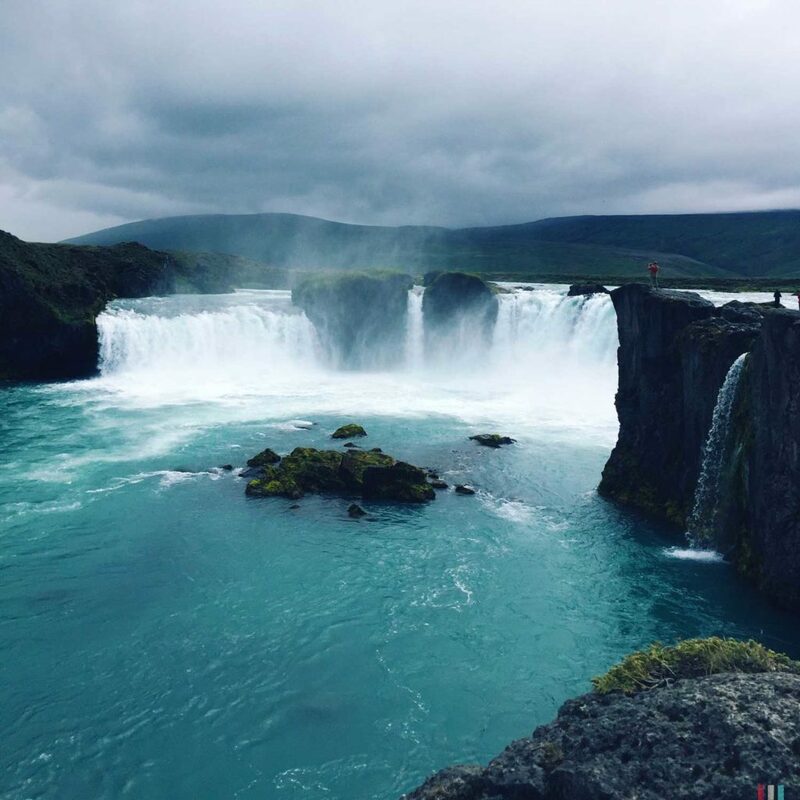 Iceland is the land of fire and ice, full of great things to do and see. Not only alongside the ring road. 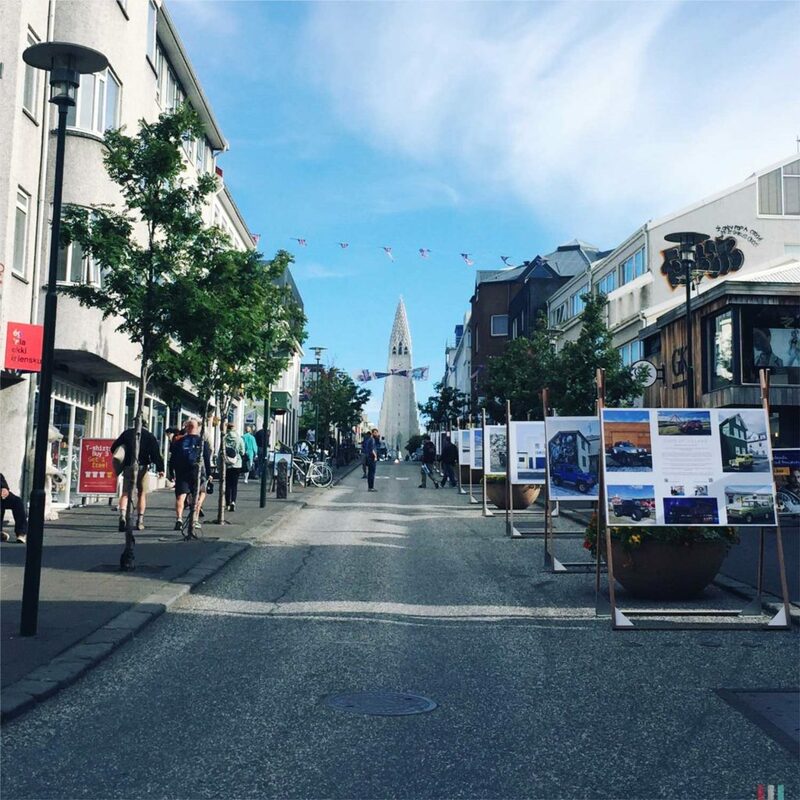 Most people visiting Iceland are taking the ring road. 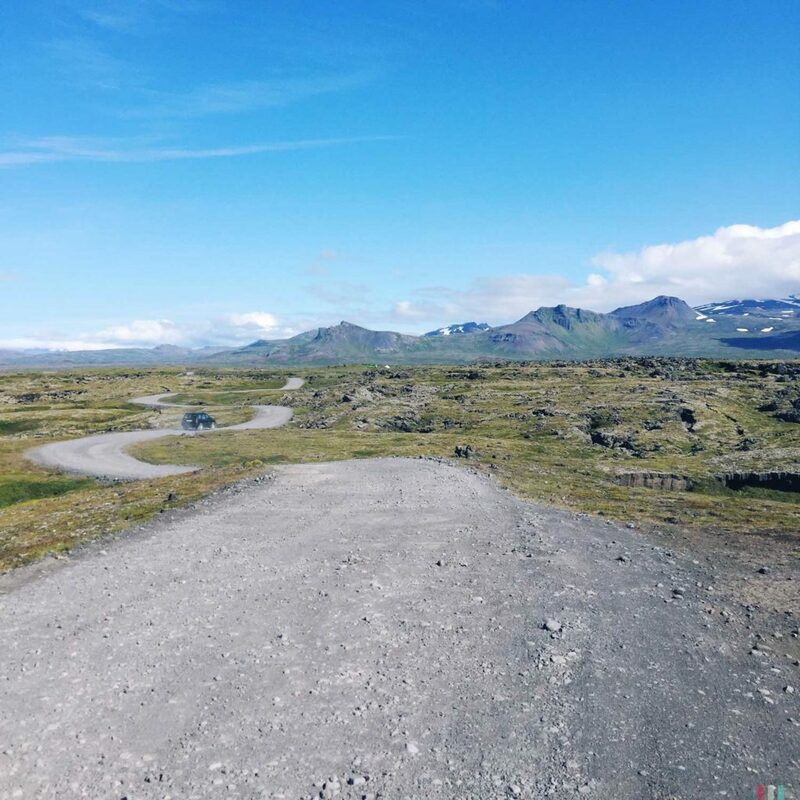 The ring road goes all around Iceland, passing most of the main tourist attractions. Easy to do in about ten to twelve days. If you’re looking for a bigger adventure, just get a proper 4WD, take one of those F-roads to the inland and keep on following the mud. 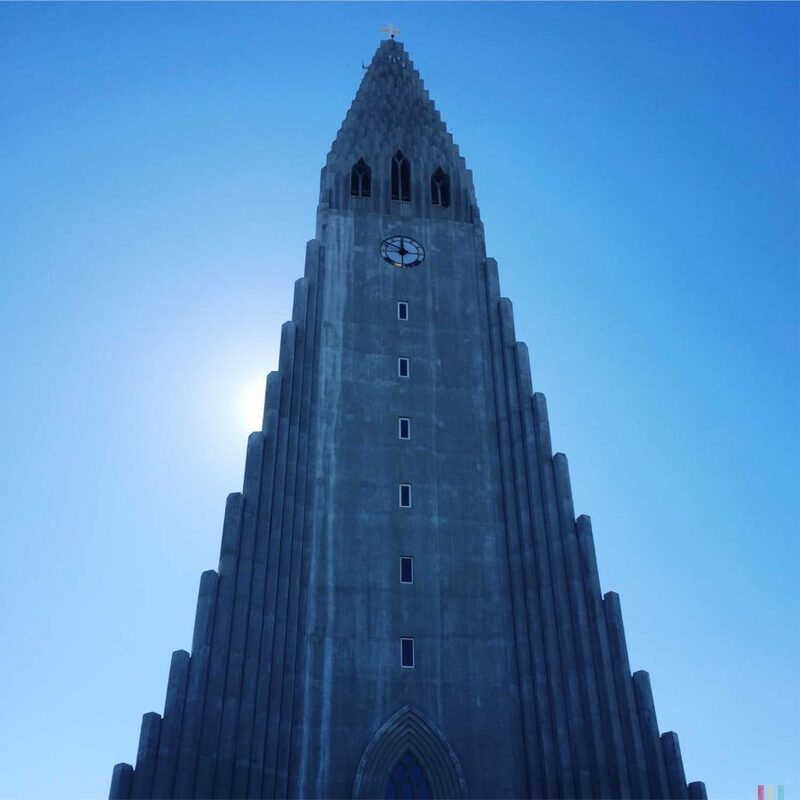 What’s too often missed out: Snaefellsnes! 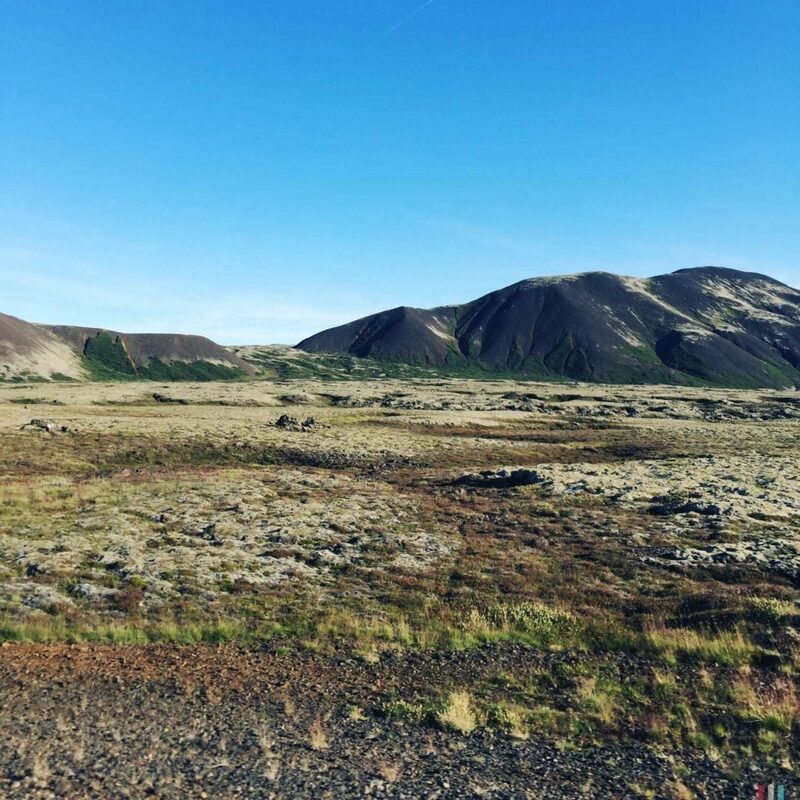 Snaefellsnes is a small peninsula in the northwest of Reykjavik, often called “Iceland in a nutshell”, as you’ll find everything making Iceland such a beautiful and special place within a very small range here: volcanoes, geysers, lava fields, black beaches. 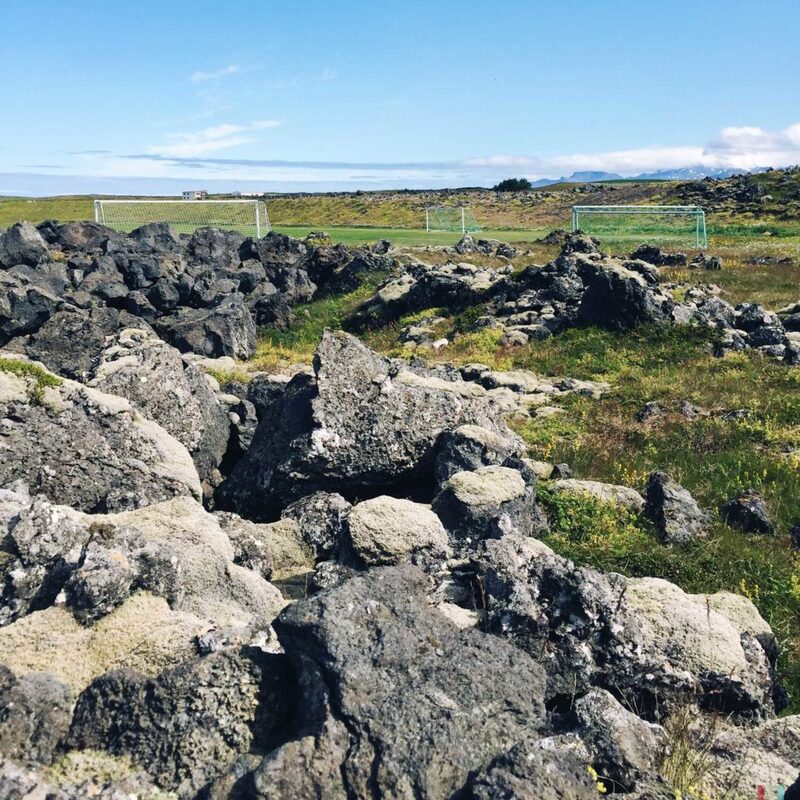 Geologically, Iceland is a pretty young piece of land, all still in the making, all bubbling and boiling. 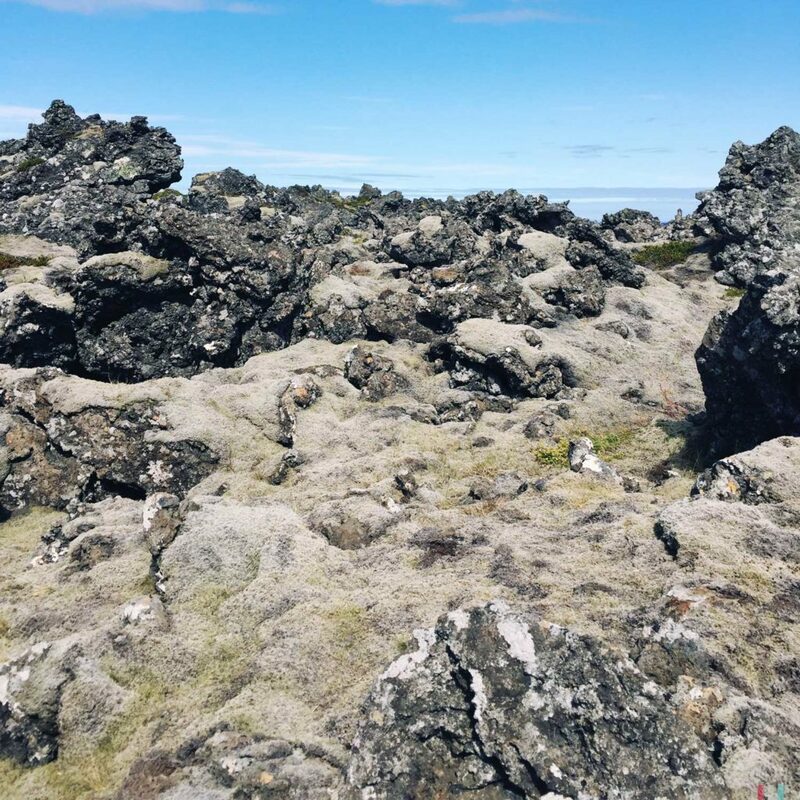 Snaefellsnes offers endless lava fields for endless hikes. 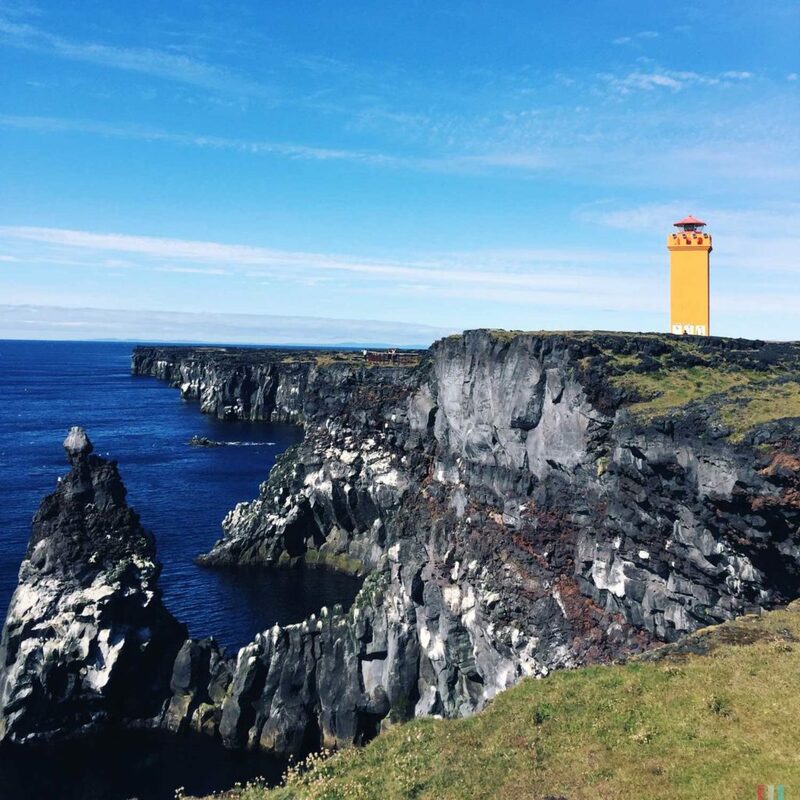 For example, it takes you two to three hours to get to a tiny little orange lighthouse at the western tip of the peninsula. From there you’ll have a great view over the ocean, almost all the way to Greenland. Lava field with football pitch. 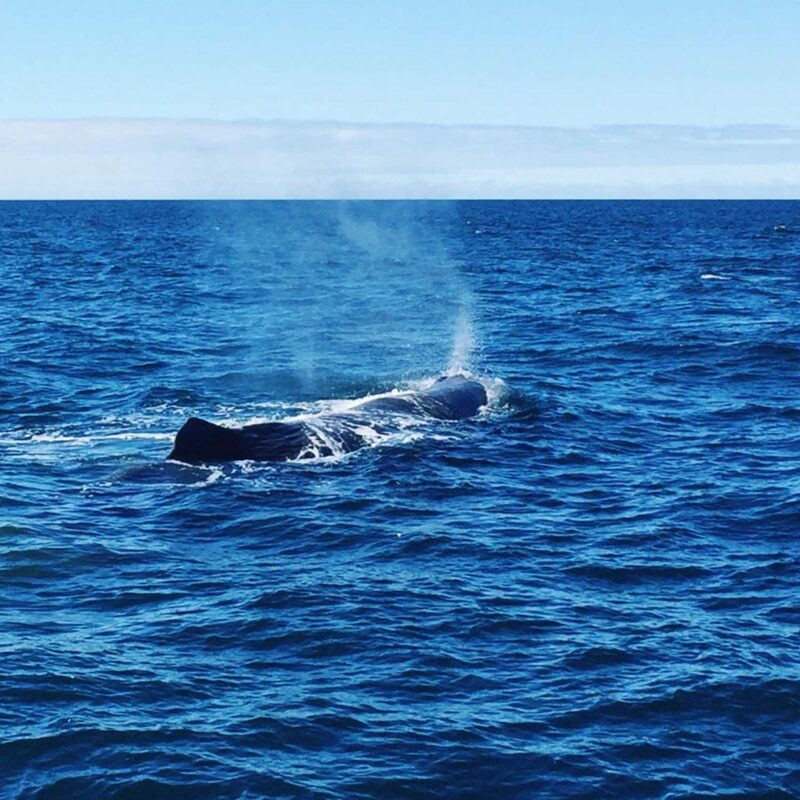 If you bring you binoculars you might see some whales, too (we didn’t!). 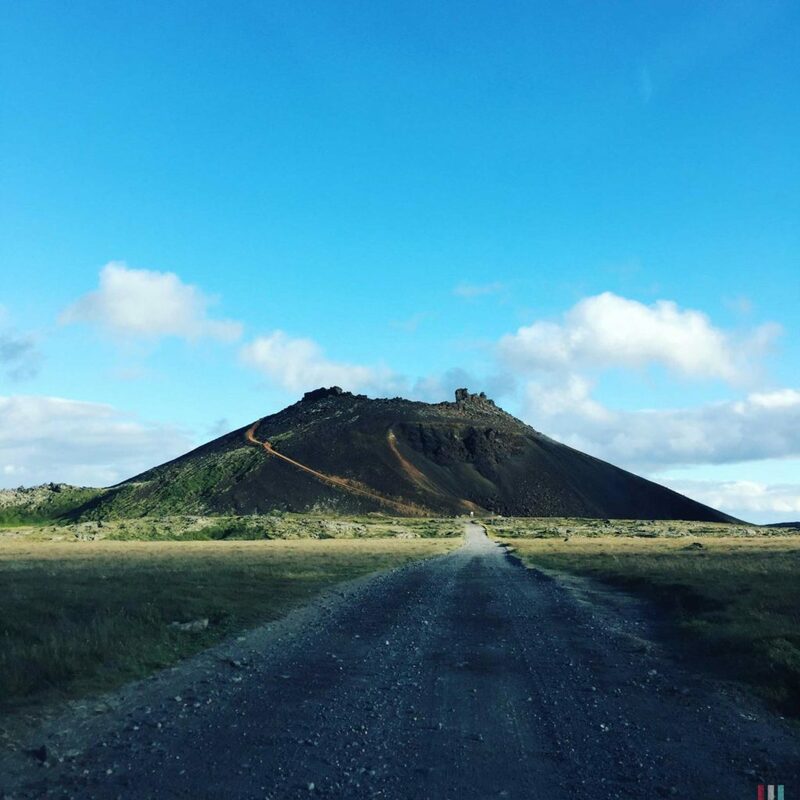 Or maybe hike the other direction towards Saxholl, an extinct and very photogenic volcano where you can even hike up to the crater (it’s only about ten million stairs to get there, easy!). We did both hikes, and I can really recommend them. However, Theresa urged me to mention that taking the car to the tiny little orange lighthouse would be the much better option. But the Saxholl is highly recommended by her, too. 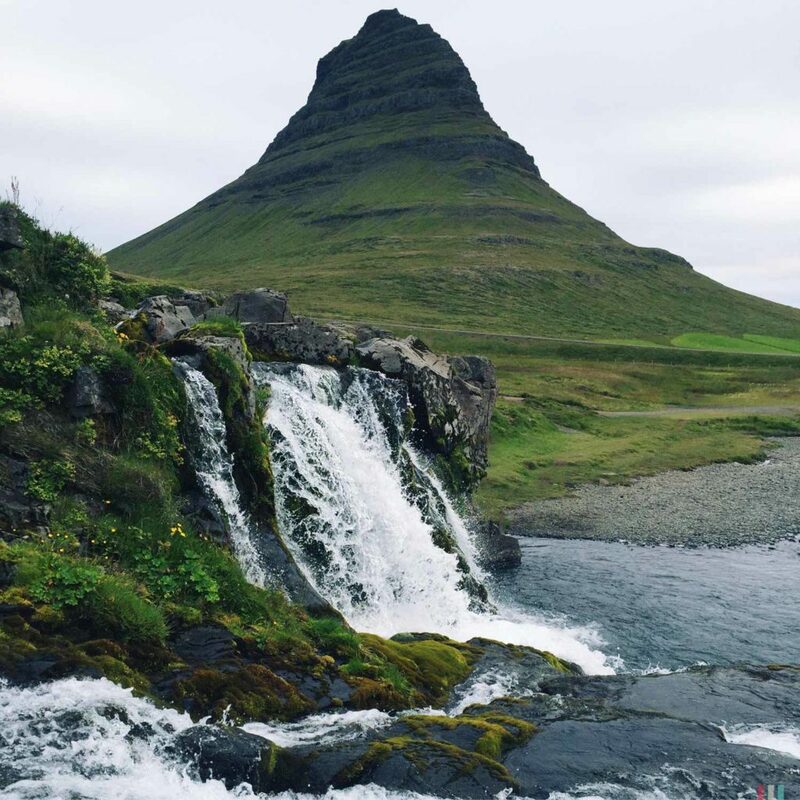 Besides volcanoes and lava fields you’ll find one of the most iconic and most beautiful mountains in the world here: Kirkjufell. 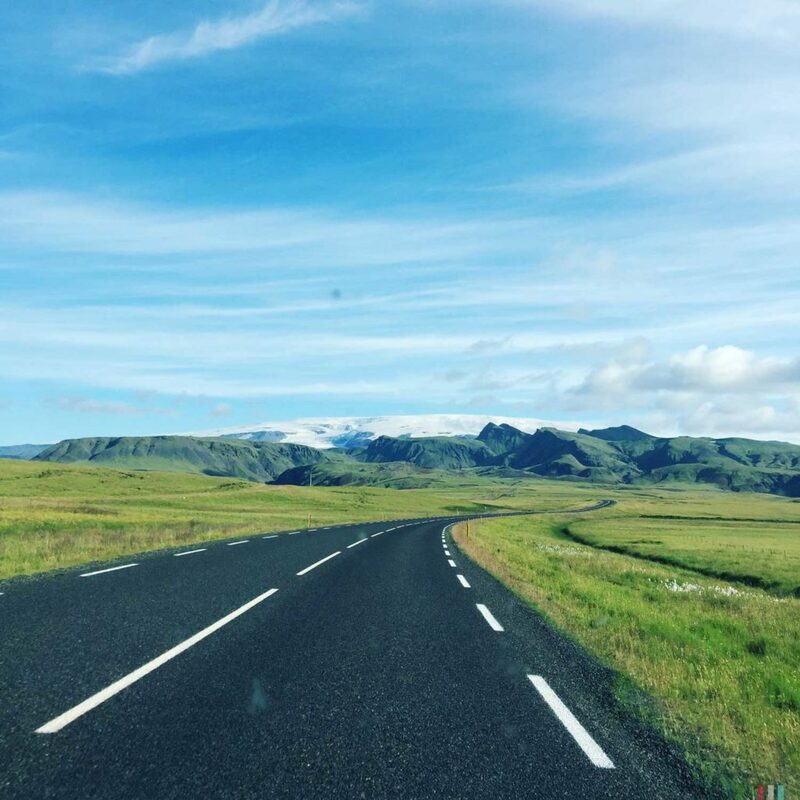 If you take the northern route you’ll automatically pass it right after leaving Grundarfjordur. It’s just standing around right next to the street there. It’s always a bit strange to finally get to those places you know only by photo. 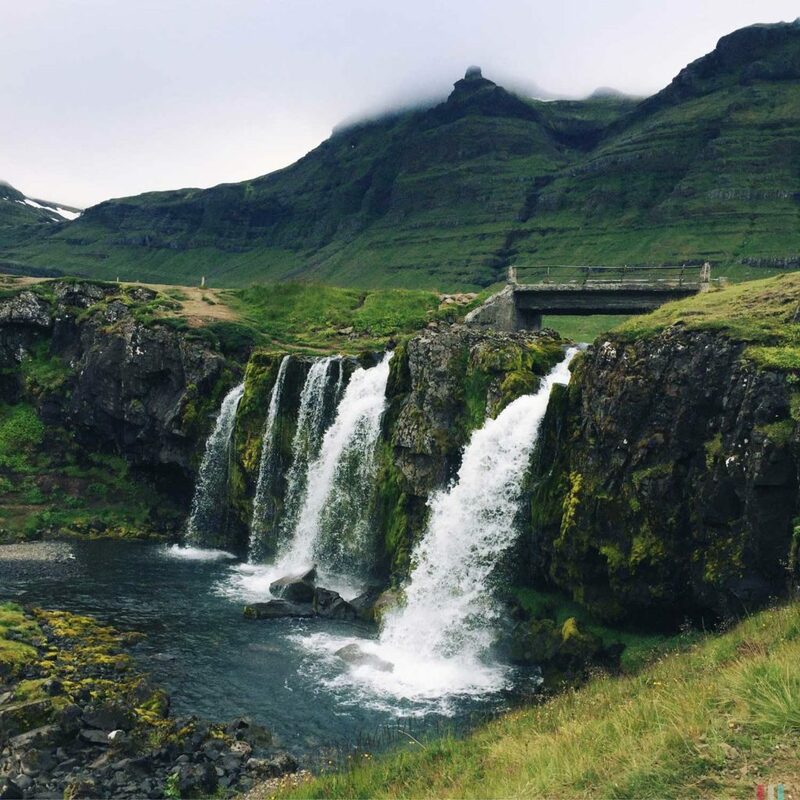 Kirkjufell mountain on Snaefellsnes Peninsula is one of those places. The most photographed mountain in Iceland. 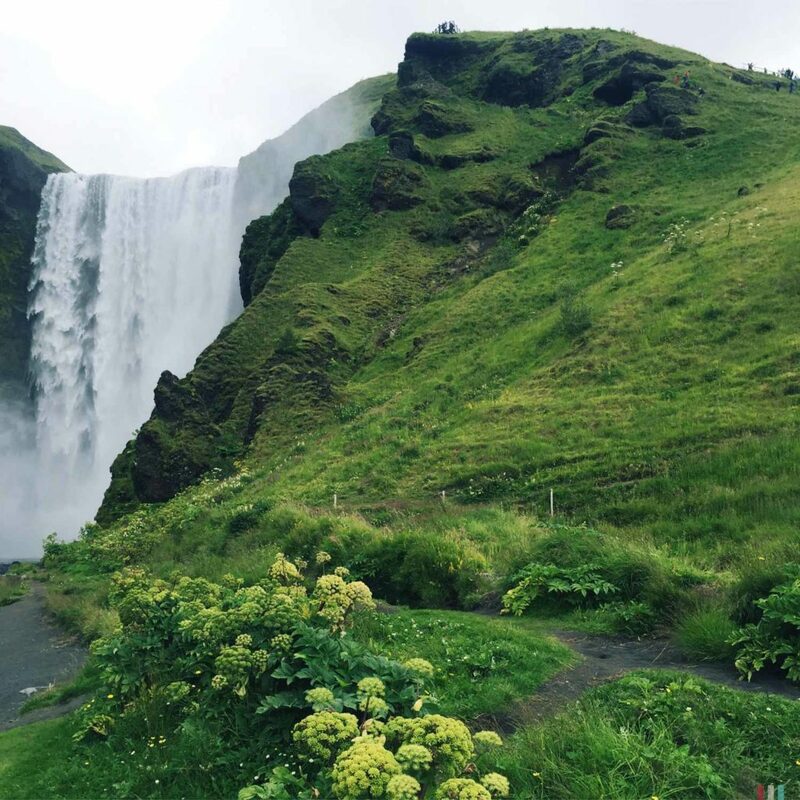 The most popular and familiar picture is probably the one taken by photographer Art Wolfe, who had Kirkjufell on the cover of his book “Eden”. Since that book, everybody wants to visit Kirkjufell. Us, too. 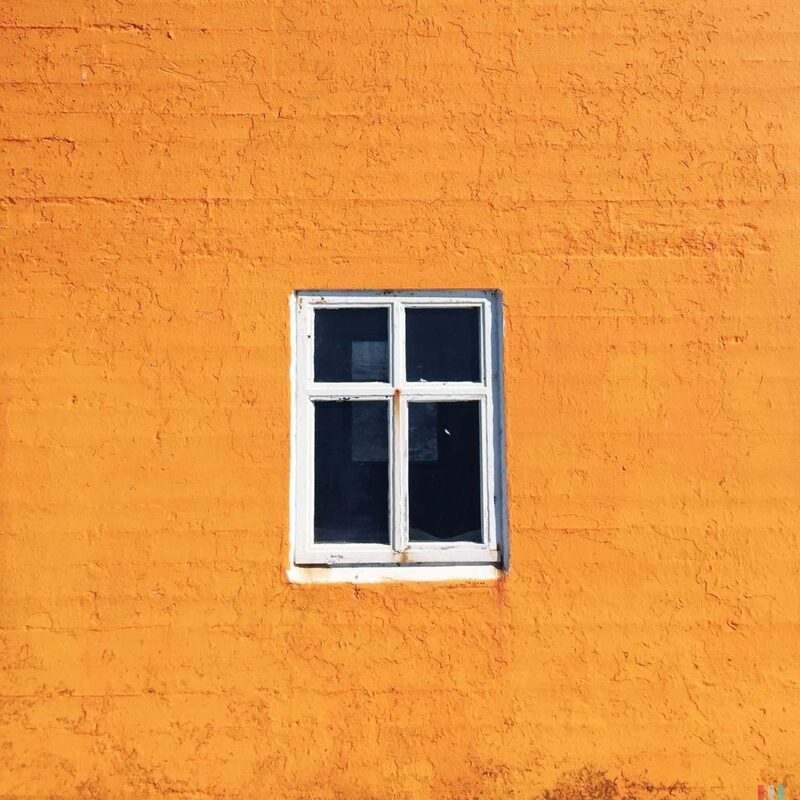 And with nothing but those pictures in mind, reality sometimes is a bit underwhelming. Not the mountain, of course, the mountain is as overwhelming as expected. But the things around. The main road, just in front of the mountain. The parking lot, a highly frequented drop-off-zone for busloads of tourists. Or the well-kept path to the little waterfall that allows you to take the classic shot of the mountain plus the waterfall, without getting your shoes too dirty. Those things. That’s how it is with the places you know only by photos. 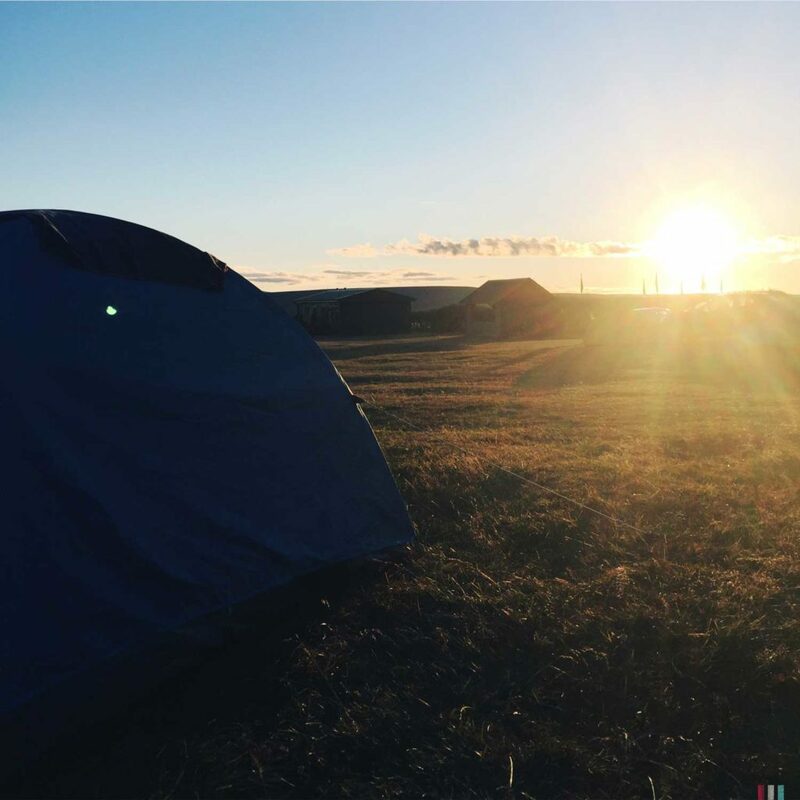 The more photos, the more people who want to go there. Making their own photos. Probably you have to deal with it. Just think those main roads and parking lots away. And only remember the picture. Another iconic and well known mountain on Snaefellsnes: the mighty Snaefellsjökull. 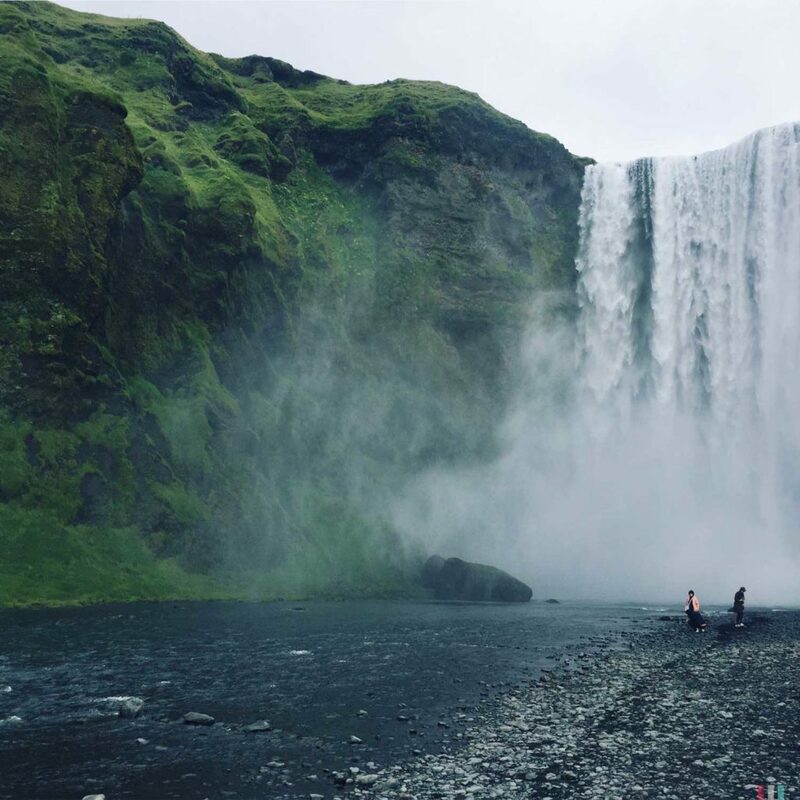 Compared to Kirkjufell it may not be a real beauty – but it was the entrance to the underworld in Jules Vernes “Journey to the Center of the Earth”. Completely covered with snow and ice, it’s a perfect place for a guided glacier tour. And there’s no roads, parking lots and busloads of tourists at all. 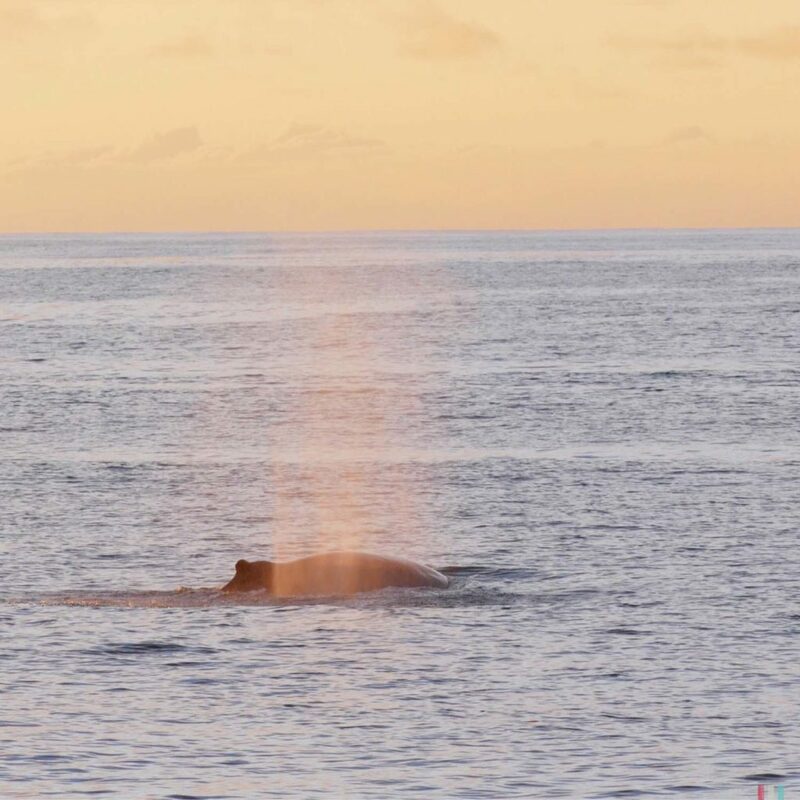 A sperm whale, resting. 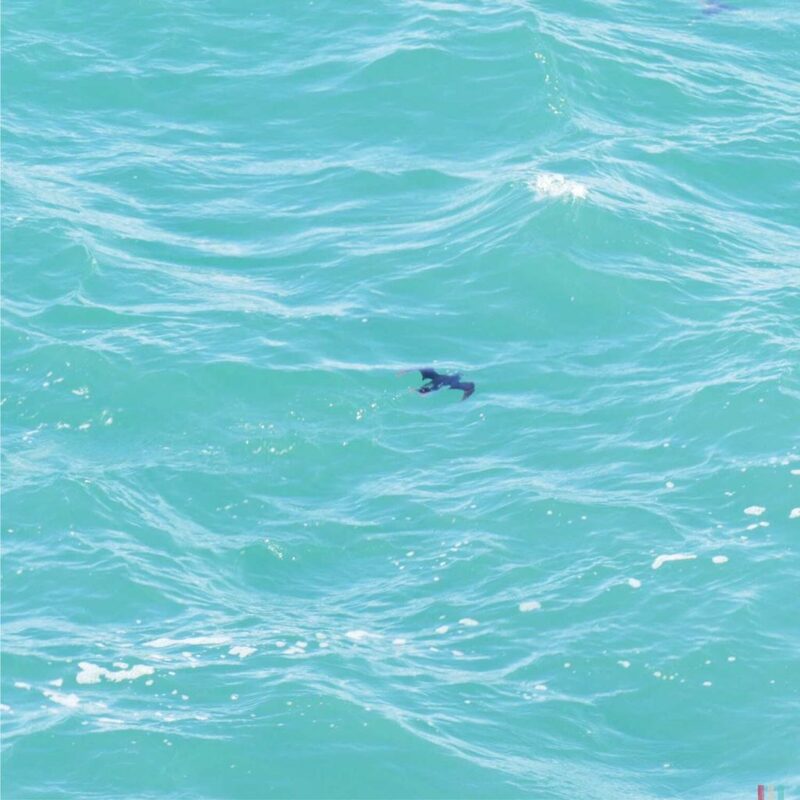 We saw one even breaching several times. 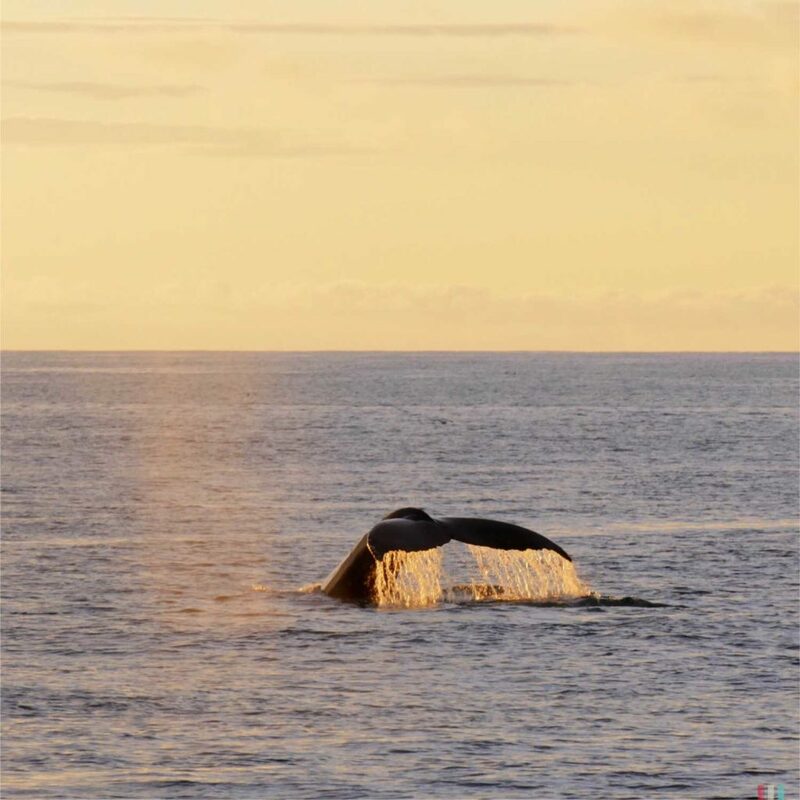 Besides the iconic volcanoes and glaciers, Snaefellsnes provides another great thing: sperm whales!  The whales are widely spread in Iceland, but you won’t see the same species at the different whale watching hot spots. 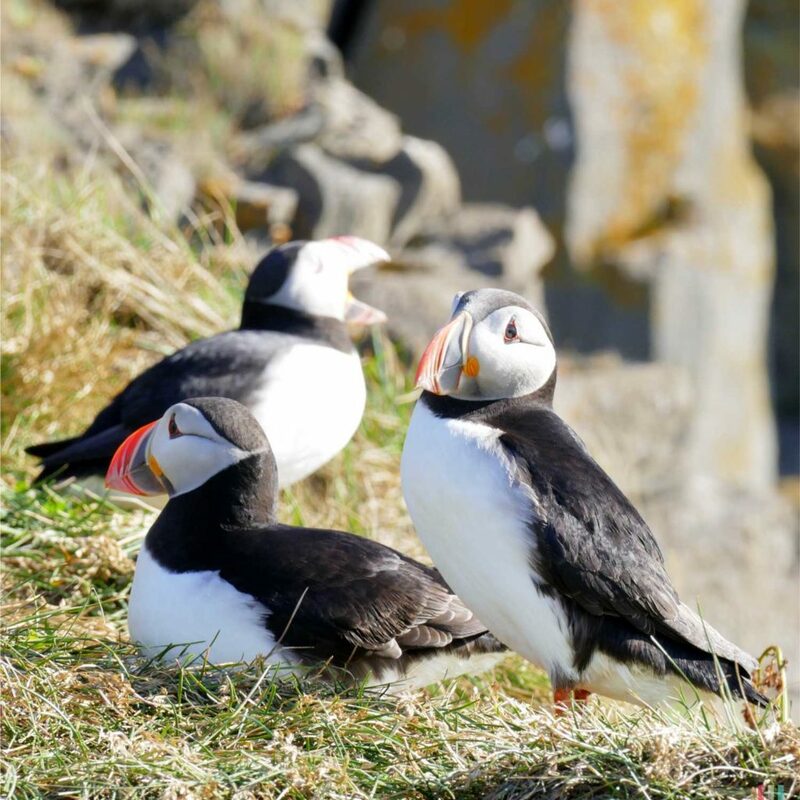 Starting from Reykjavik you’ll most likely meet minke and humpback whales, same with the northern parts of Iceland – plus the regularly seen blue whales around Husavik. 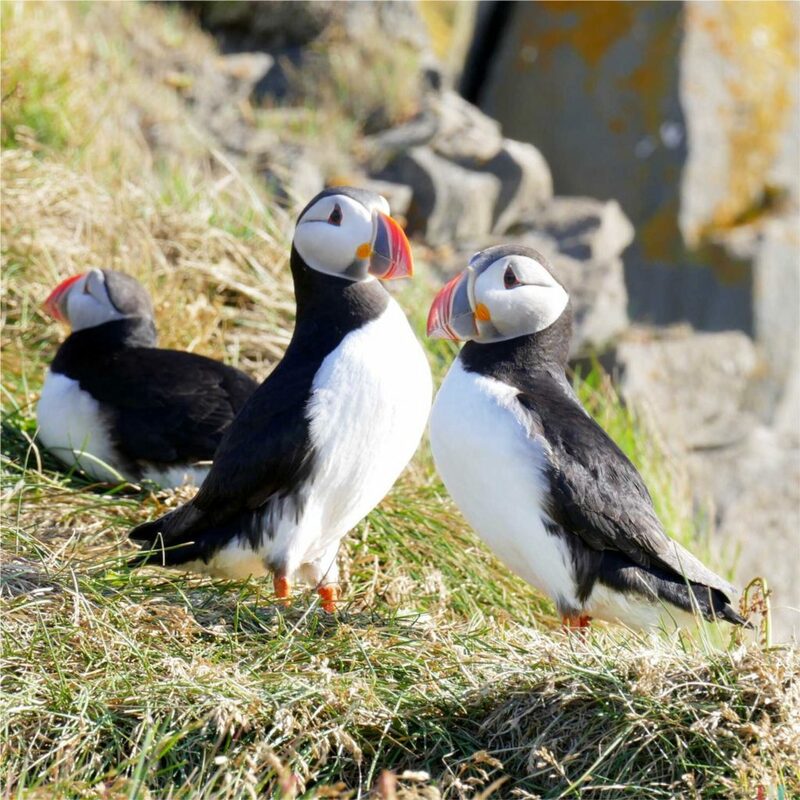 Off Snaefellsnes you might see minkes, orcas and sperm whales, but not necessarily the other species. 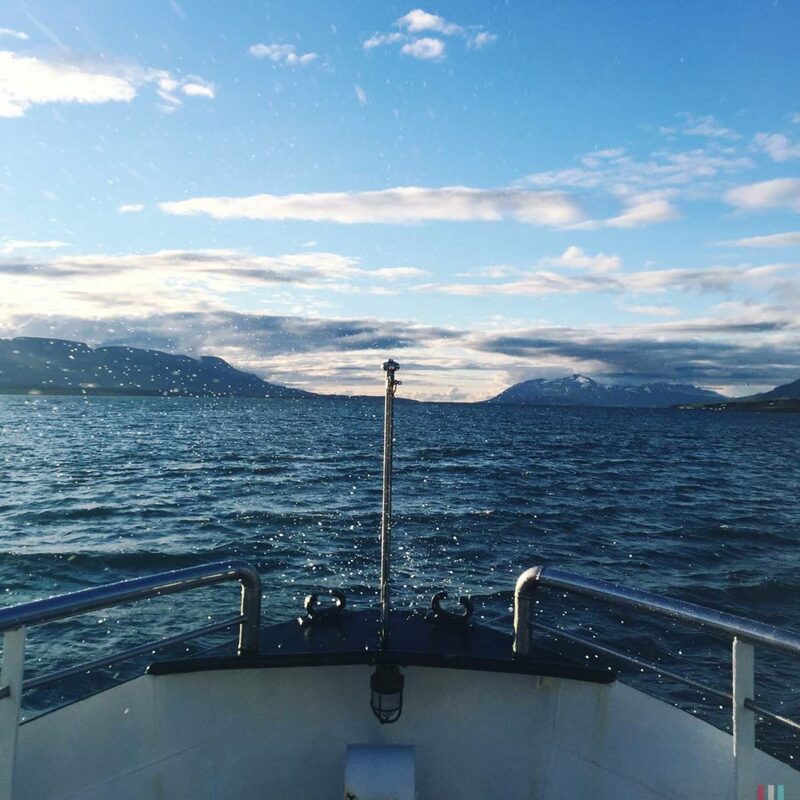 So, when you’re on a road trip in Iceland it makes perfect sense to hop on many boats in many areas. 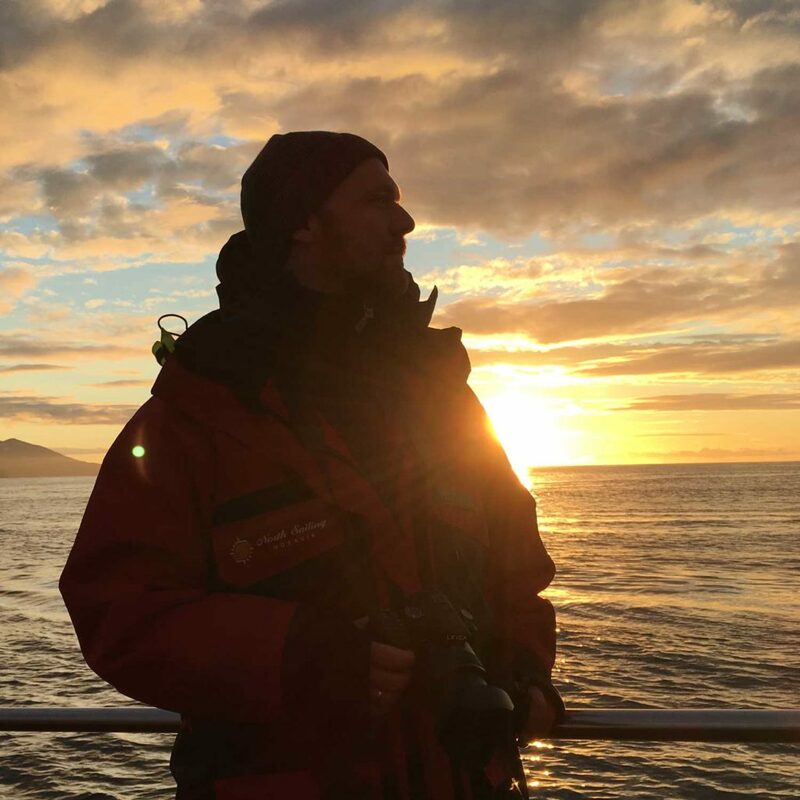 If you hope to meet sperm whales, Norway, the Azores or New Zealand would normally be your first choice. You can count on seeing them there. 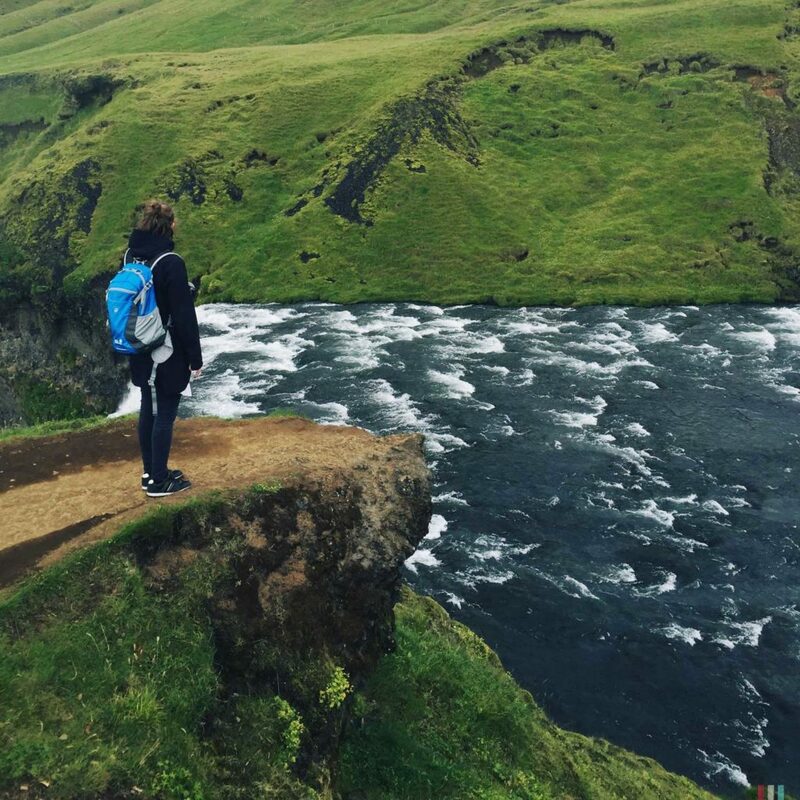 But in Iceland, your chances are pretty good, too. 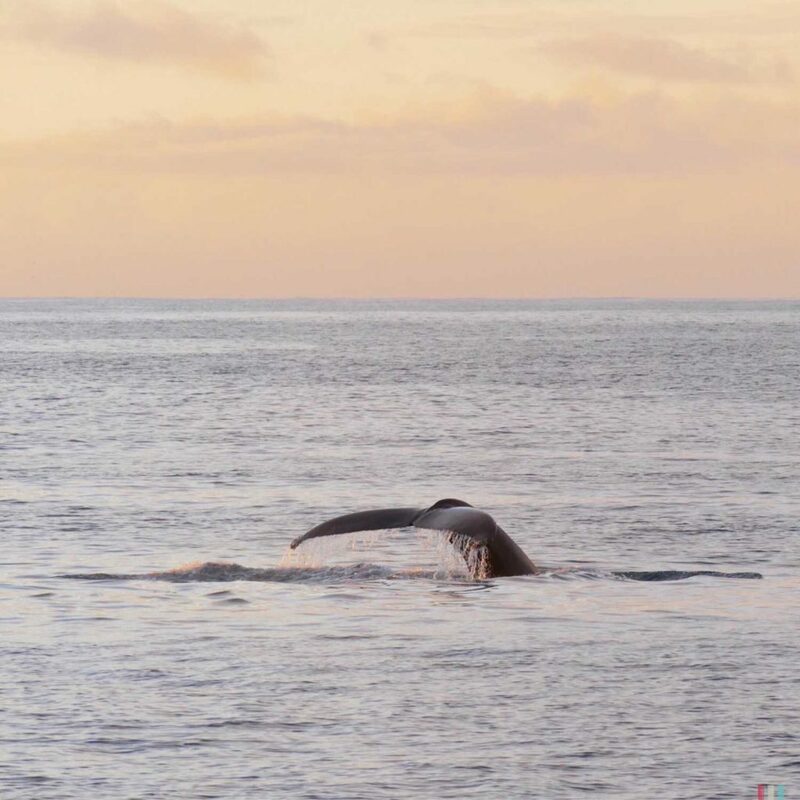 A sperm whale off Olafsvik. The blow is pointed to the left. 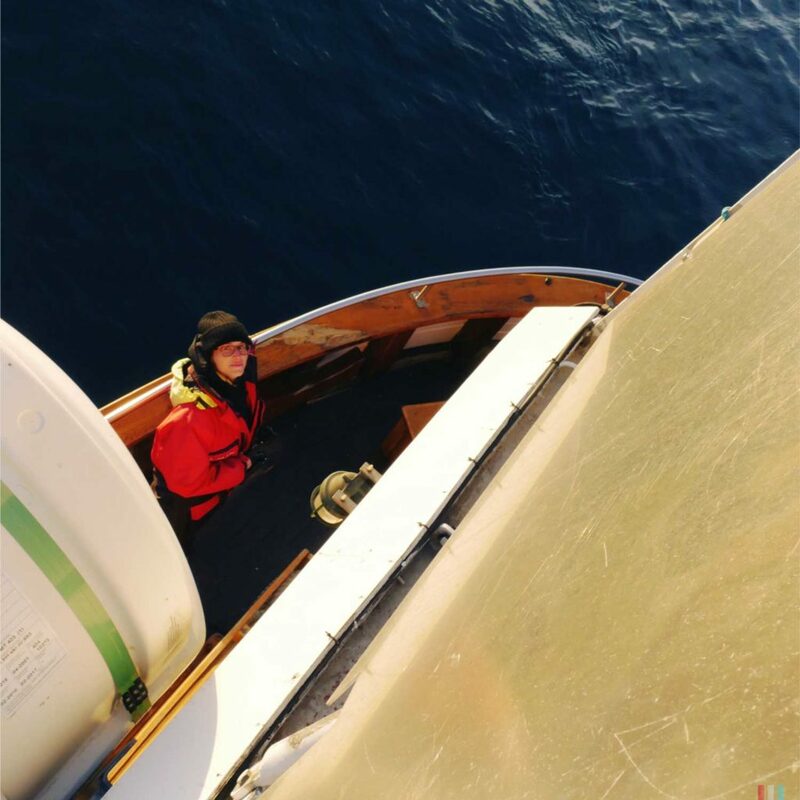 We were lucky right on our very first trip in Olafsvik: three sperm whales, constantly diving for only a short time and then calmly resting at the surface for a while. 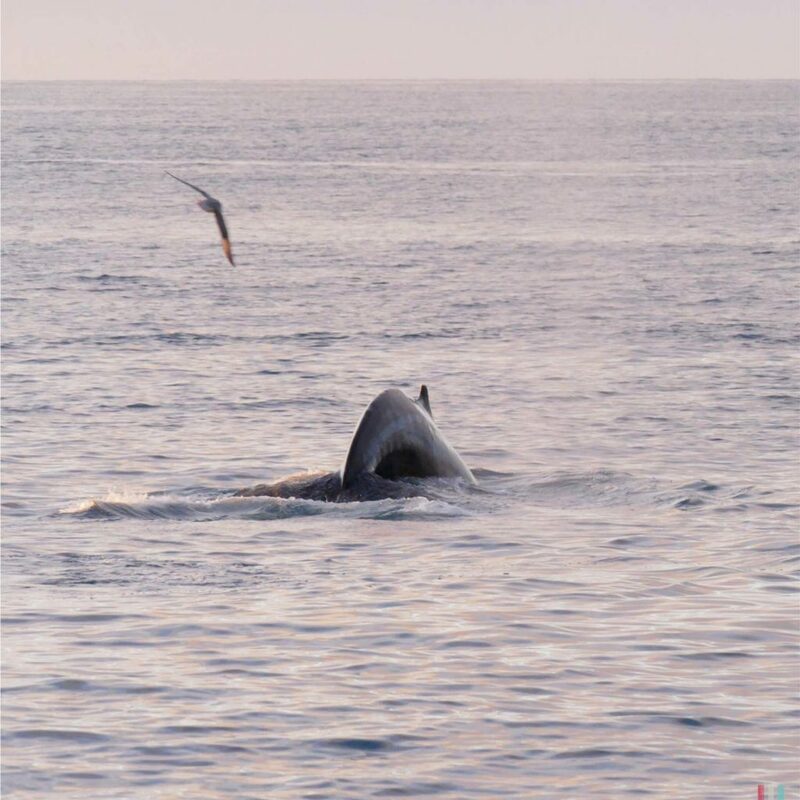 Usually you don’t have to wait when a sperm whale went for a dive. They can stay underwater for more than one hour. 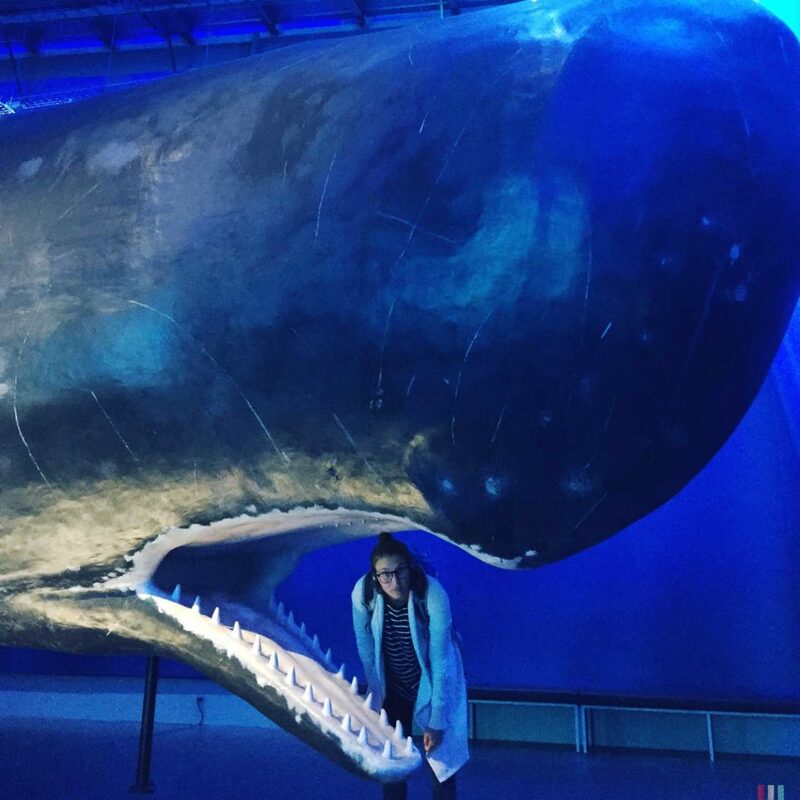 At least for me, sperm whales are the most fascinating and most impressive of all whales (Theresa is more into orcas, though) and I’ve already written down most of my excitement here. 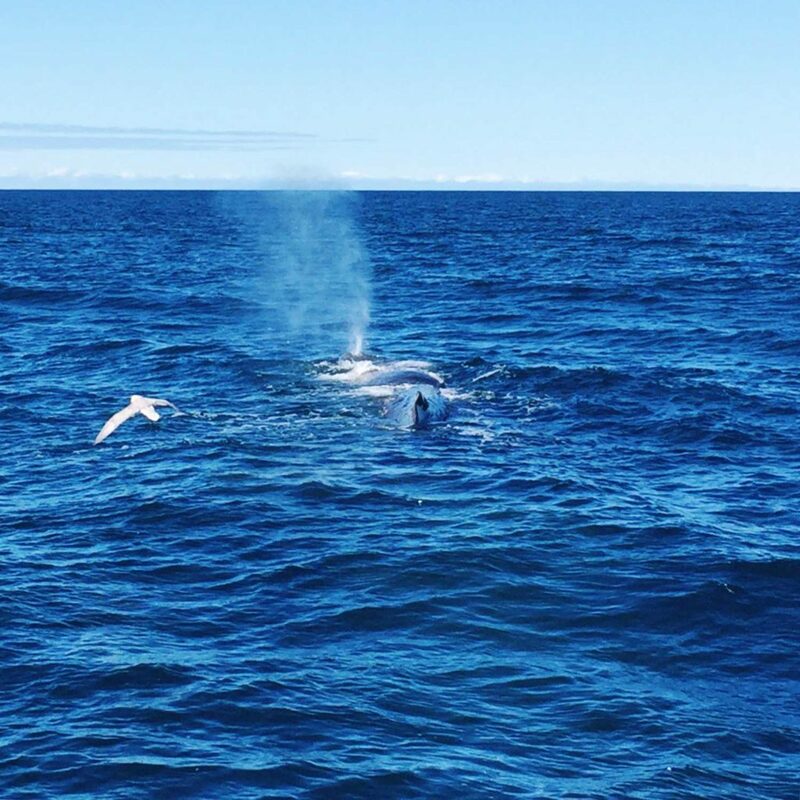 But we were not only lucky to meet them, we were even extra lucky to see them breach. 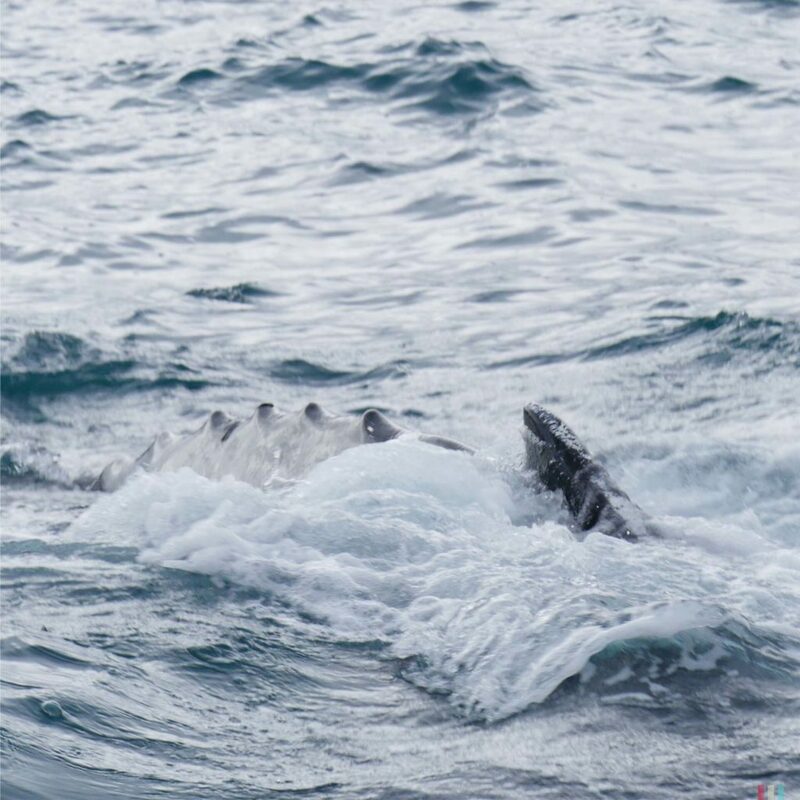 A lot of whales love to breach. Sperm whales don’t. After their extreme dives they’re normally not in the mood to breach, but just totally exhausted. But in this area the waters seemed to be a bit shallow, at least the sperm whales weren’t diving for such a long time. So obviously they still had some energy left when surfacing. Three breaches, close to our boat. Sperm whales can weigh about fifty tons. It’s a huge splash when such a giant crashes on the water. 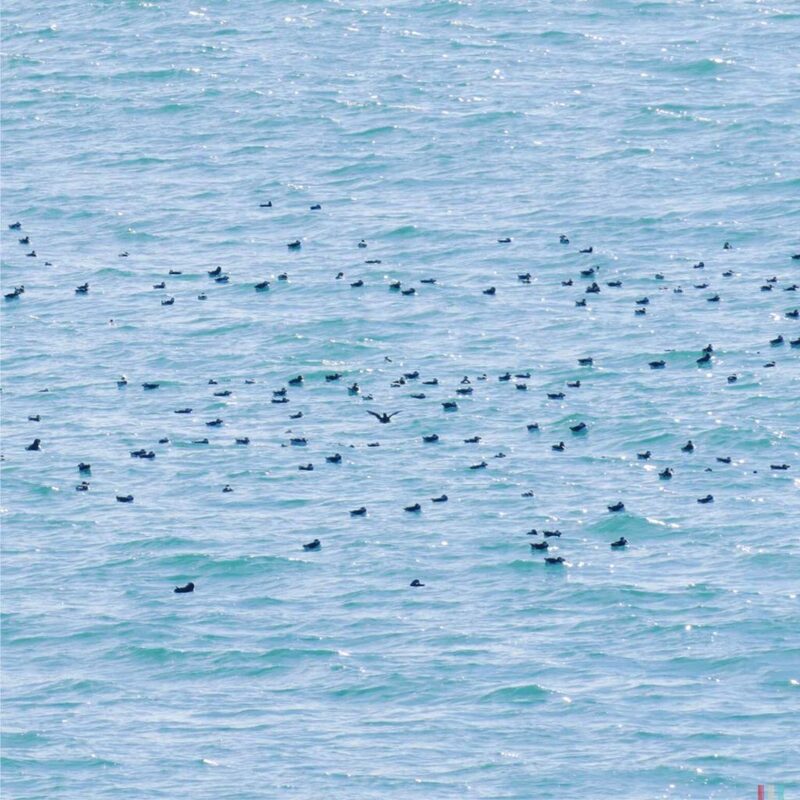 But with the special luck of seeing them breach came the very special bad luck of not having any battery left. Not in the camera, not in the phone, nowhere. 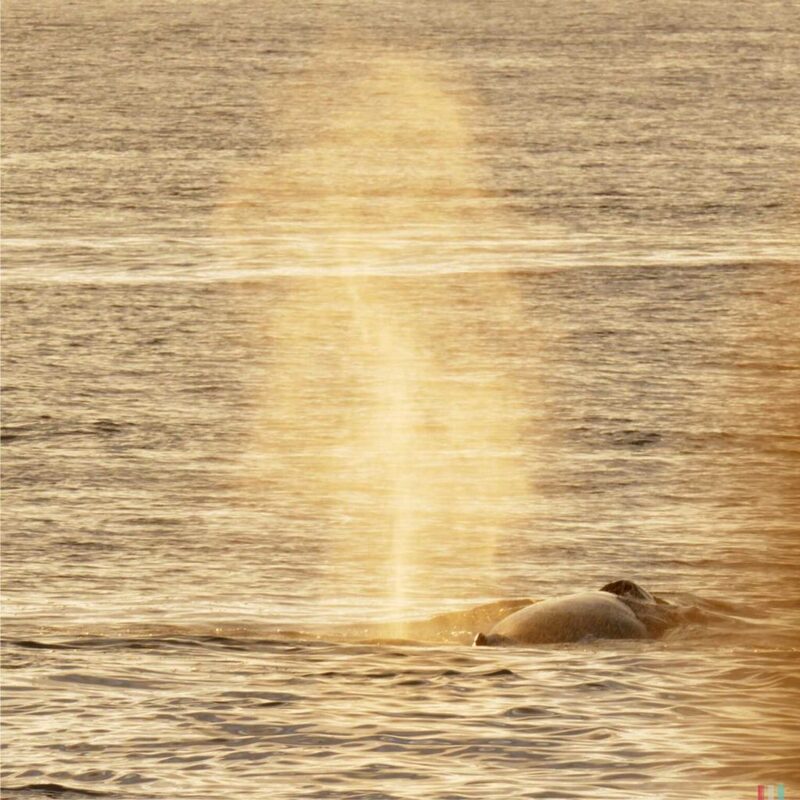 So, no photos of a breaching sperm whale. Instead, some flukes! Lovely as well! 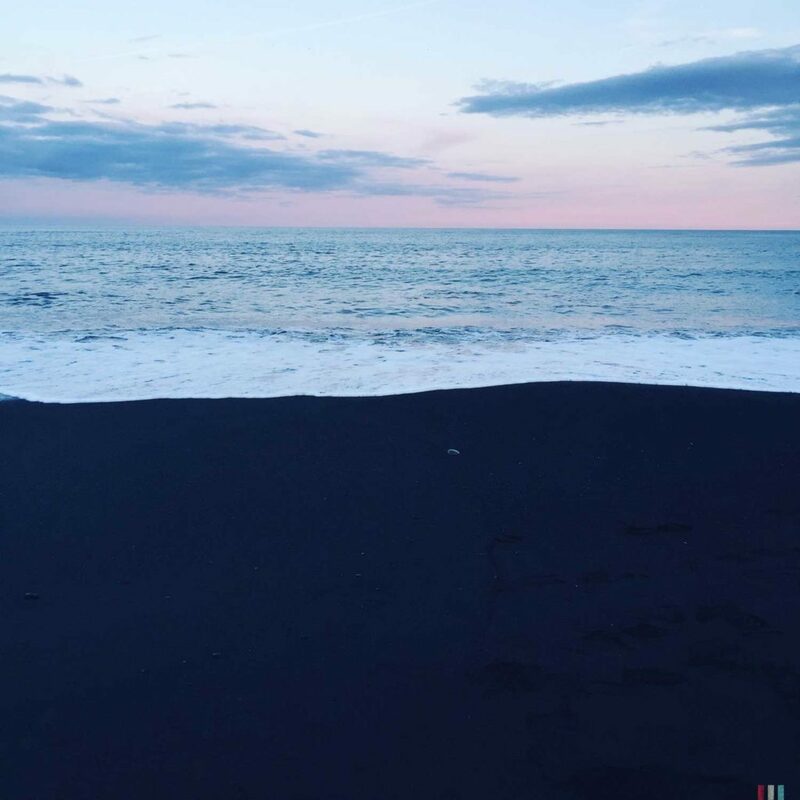 The black beach of Vik later in the evening. 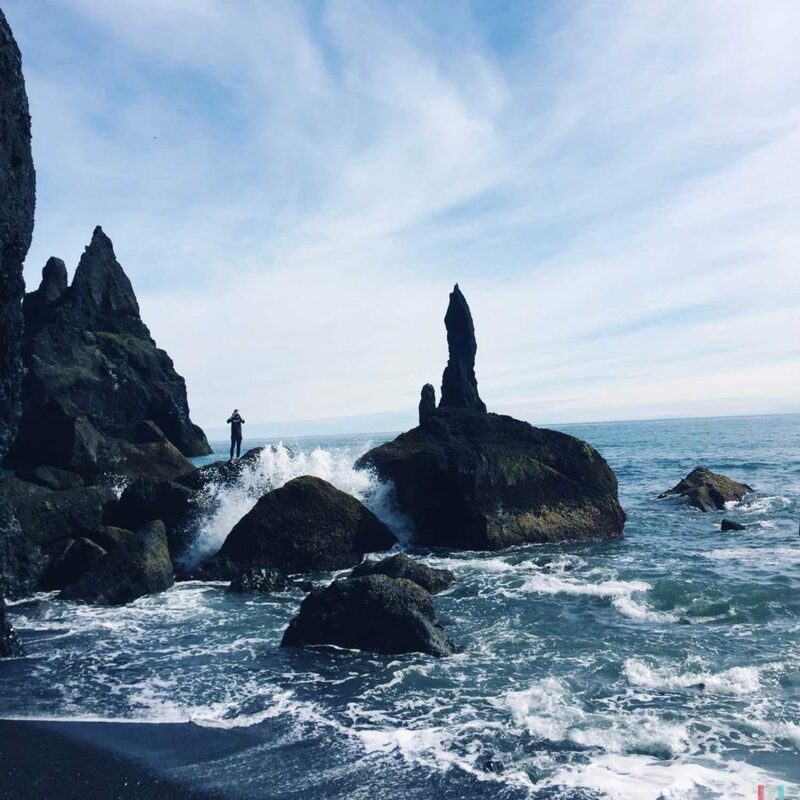 On the horizon: the goblins of Reynisdrangar. 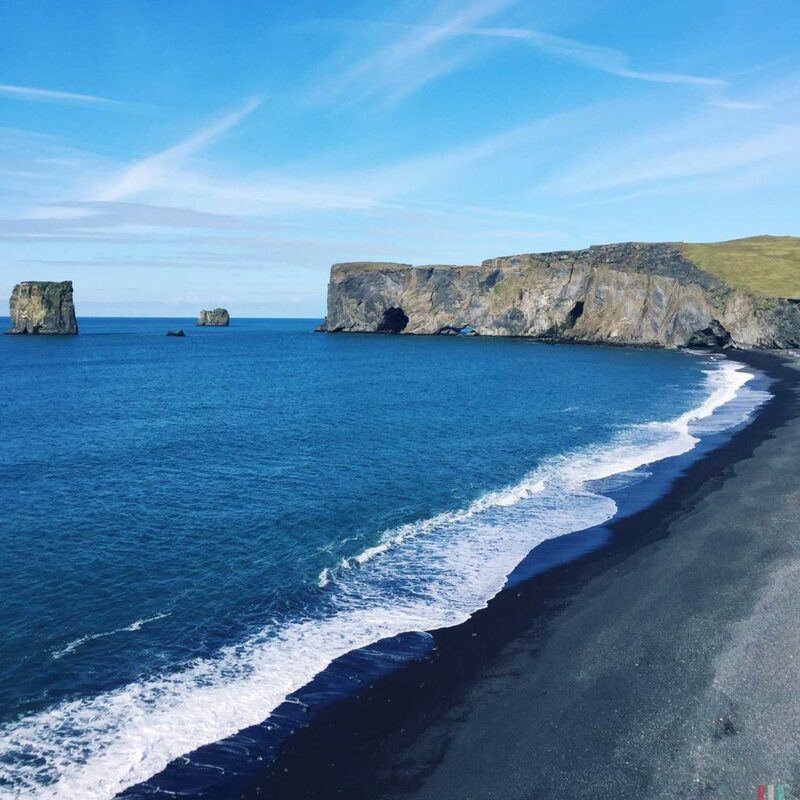 Iceland is full of beautiful black beaches. And full of lovely tales and stories. 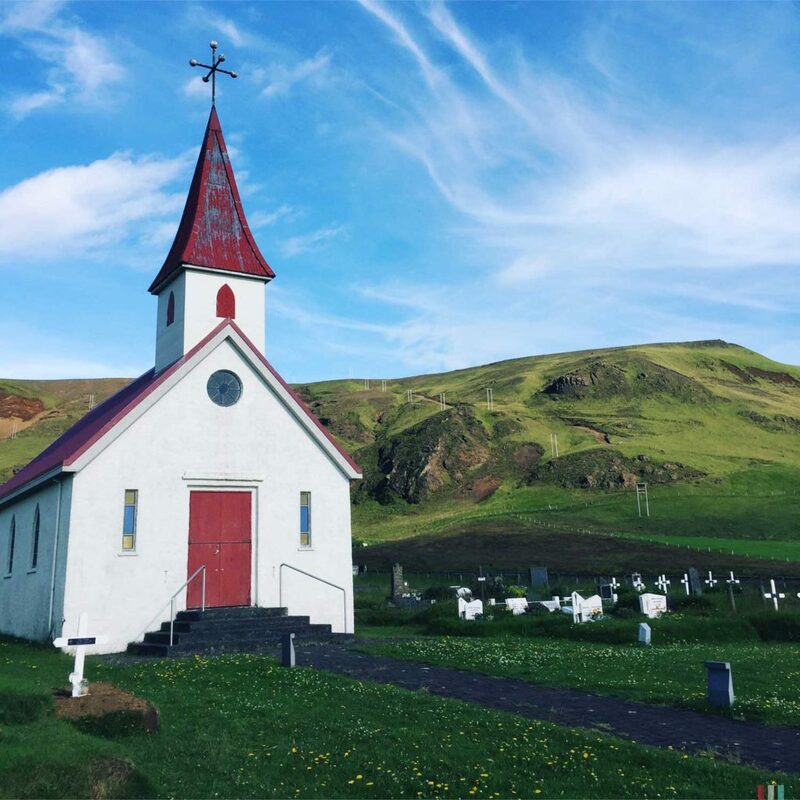 In Vik, they both meet. You always have to keep an eye on the weather in Iceland. Especially in summer. Well possible to wake up with bright sunshine, then get some snow in the afternoon before being hit by a storm in the evening. And NEVER forget to bring your rain gear. 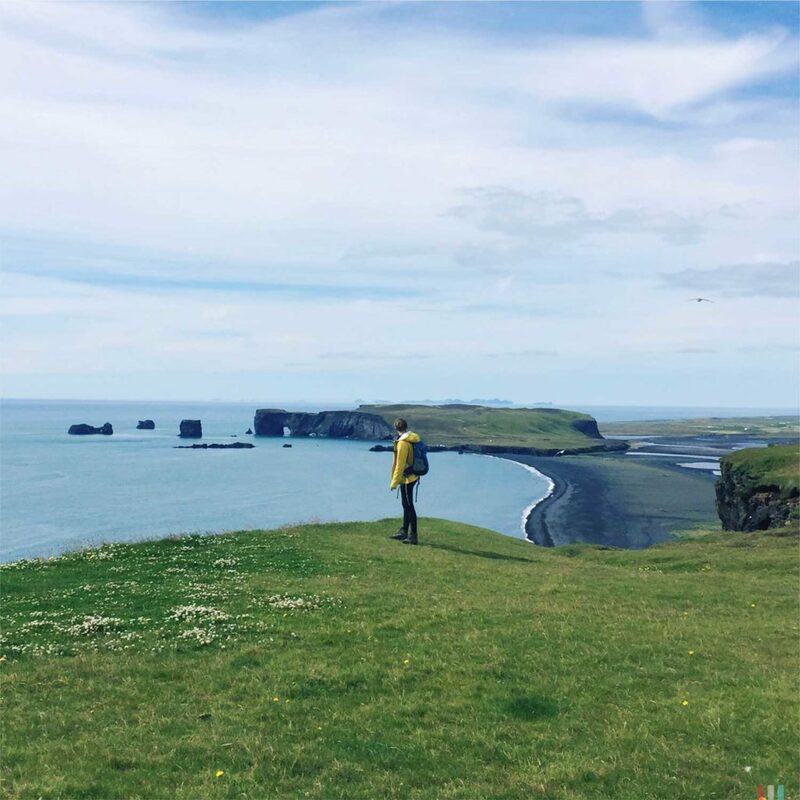 Especially when you plan to visit the beautiful and world known black beaches of Vik and Reynisfjara at the southern coast: this is one of the rainiest areas in Iceland. 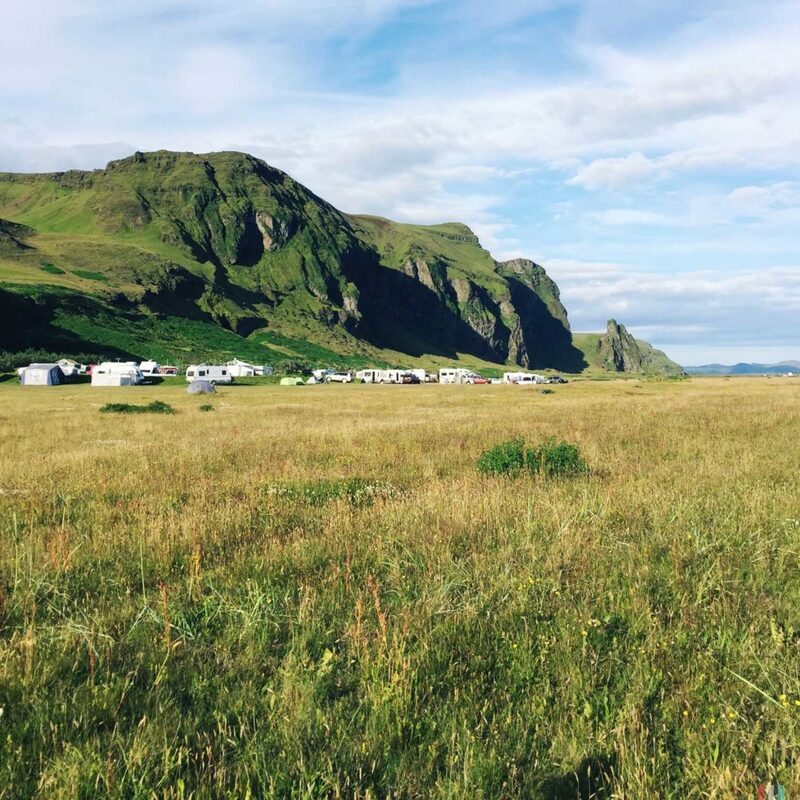 Maybe that’s why the grass seems to be even greener here than anywhere else in Iceland. Together with those black sandy lava beaches that’s such a stunning view. 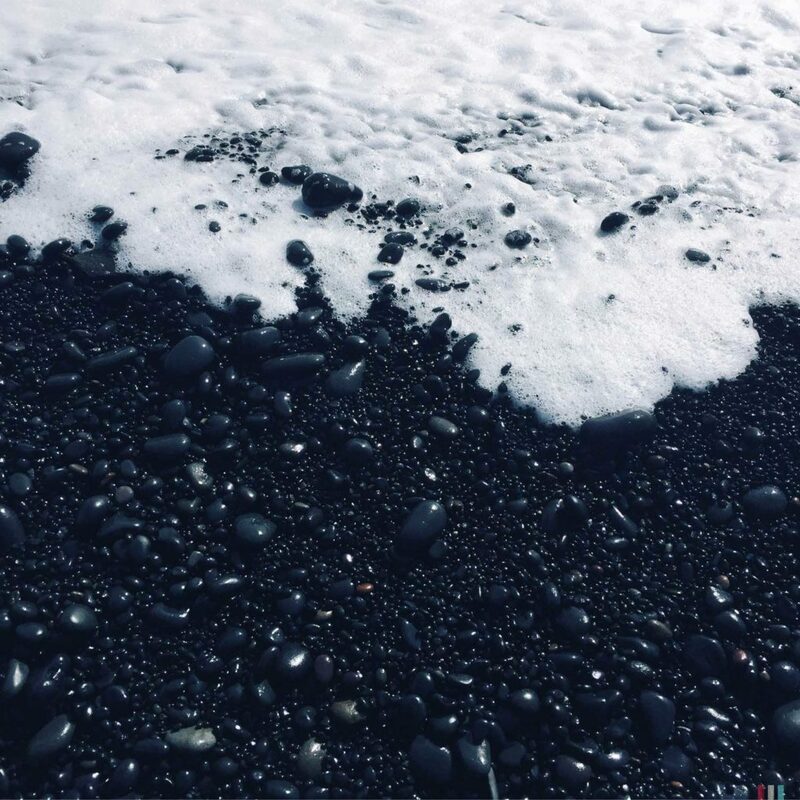 The black beach of Vik. The black beach of Durholaey. 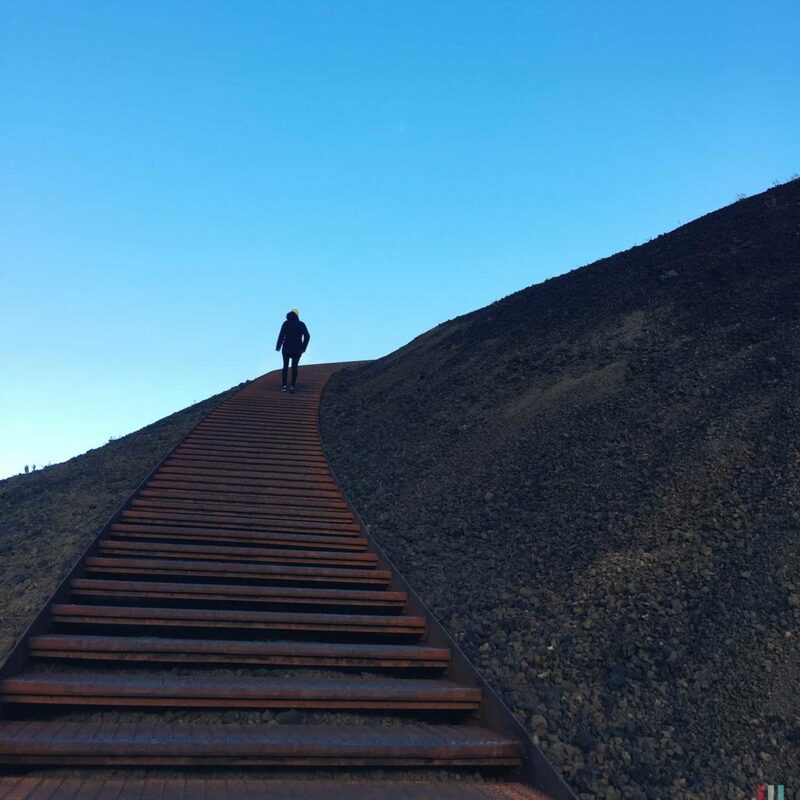 Starting in Vik you’ll need three to four hours to cross the local mountain of Reynisfjall (looks much steeper than it is). 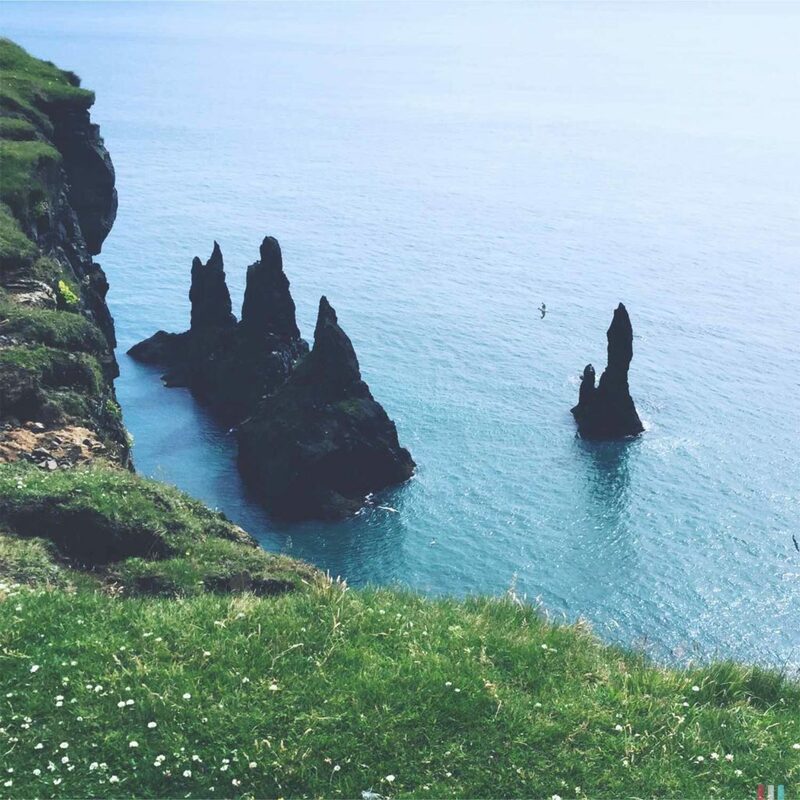 From above you’ll have a great view on both black beaches and as well on the three rocky needles of Reynisdrangar. 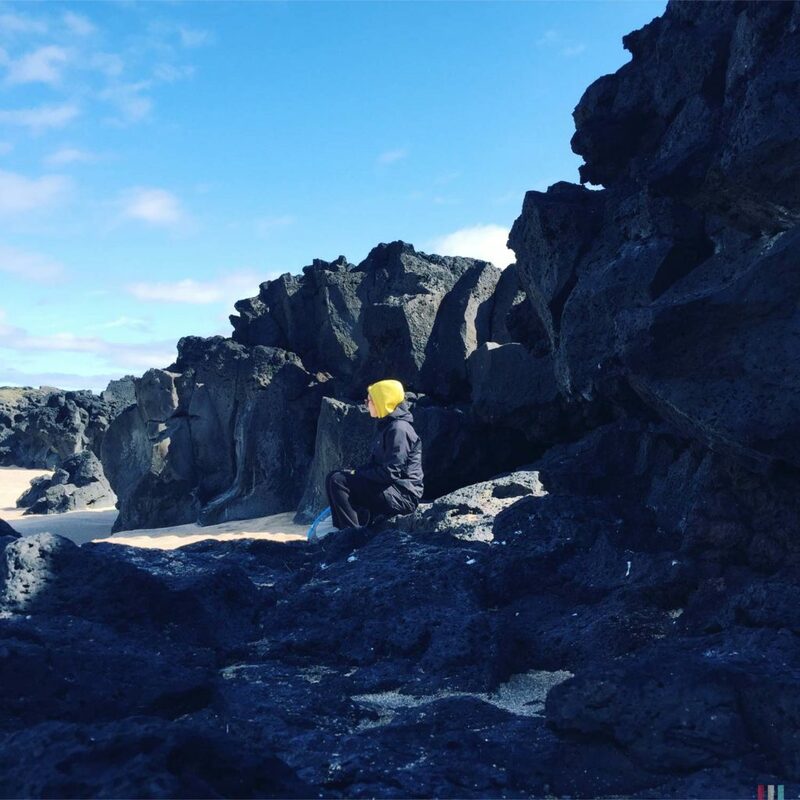 The legend says that these rocks once were three goblins trying to tow a wrecked ship but then were surprised by the morning sun that immediately turned them into stones. However, maybe that’s not exactly how these rocky needles once were created, but Iceland is full of myths and tales like this. Lovely! 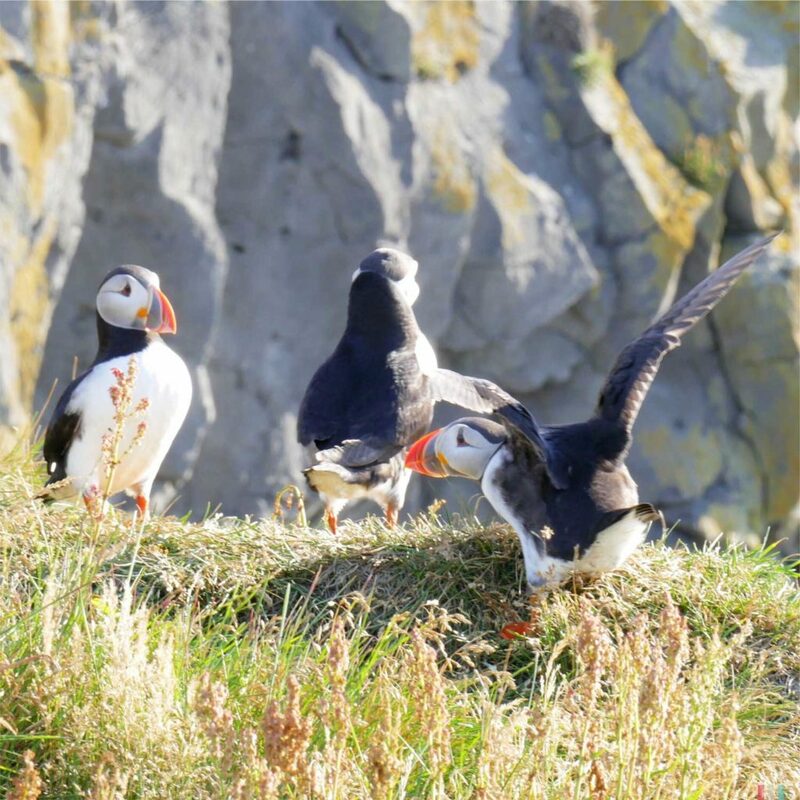 The best birds in the world: meeting puffins is pure fun. 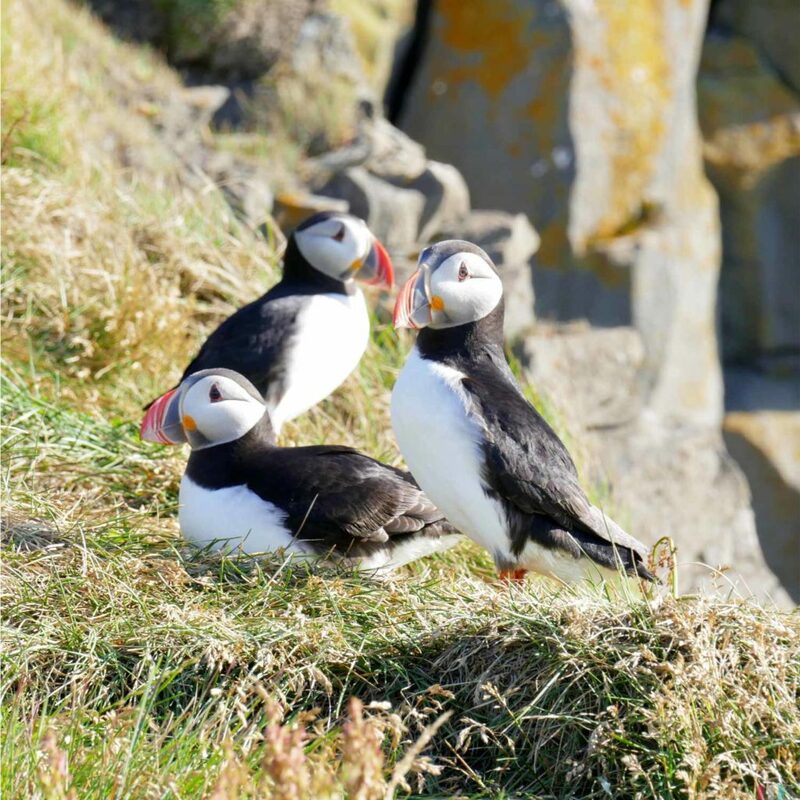 We met some puffins at the cliffs of Durholaey. And every second with them is nothing but great fun! 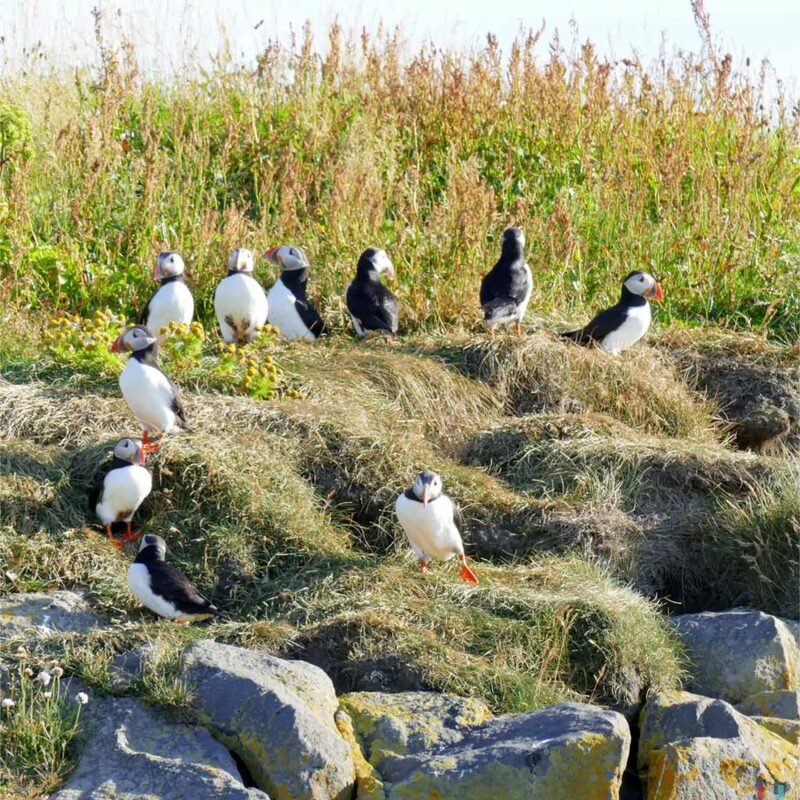 When you walk along the black beach of Reynisdrangar to it’s very end (or just take the car to Durholaey), you’re likely to see some puffins. 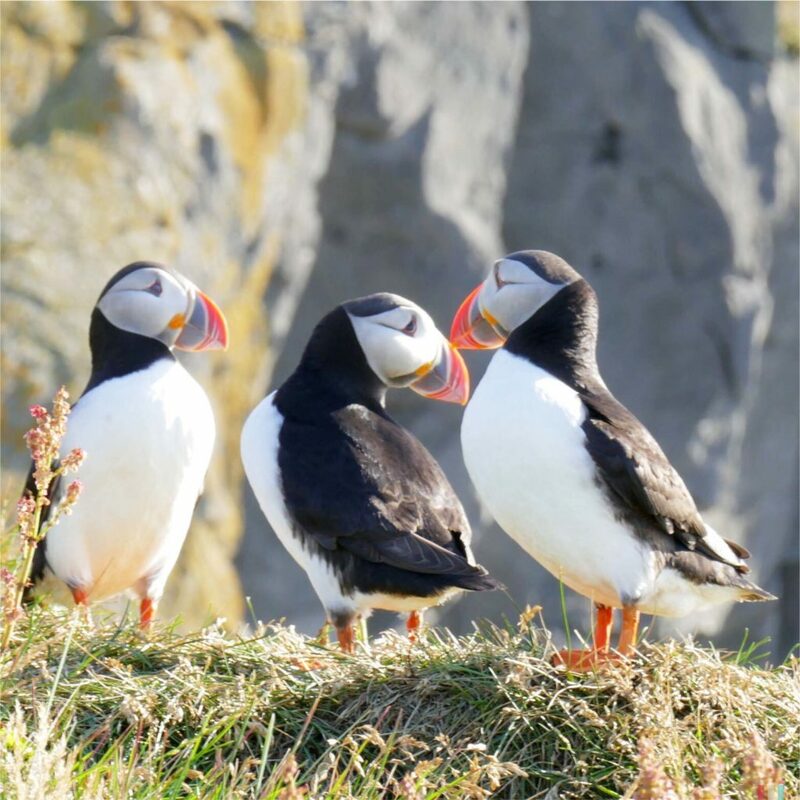 Puffins are awesome creatures and without doubt the best birds in the world. They’re clumsy and they’re eager, and while being clumsy and eager, they try hard to appear as relaxed and unimpressed as possible. Such a fantastic combination. 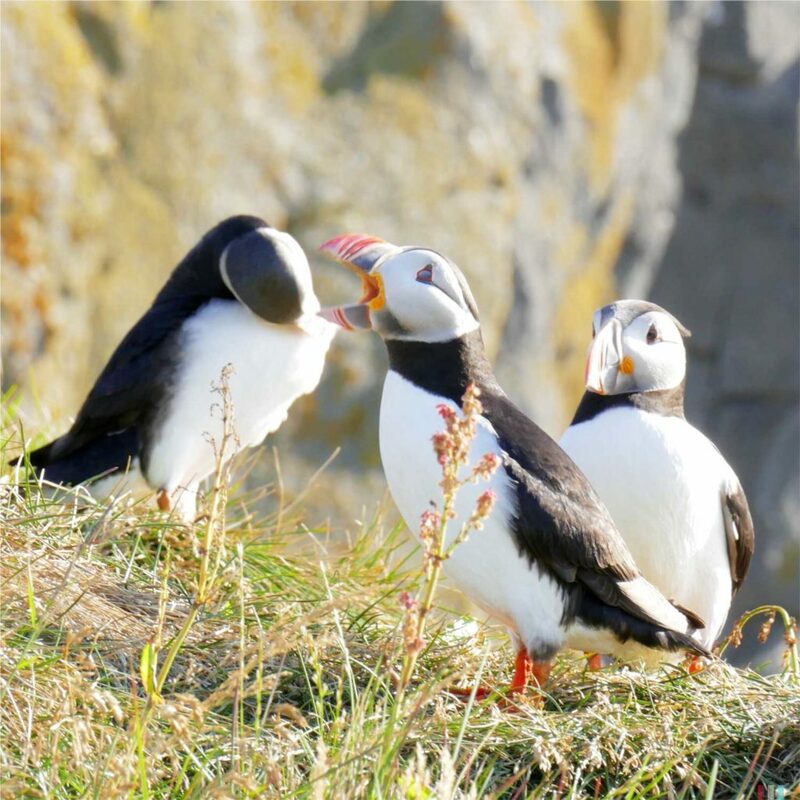 We met them several times before and it’s always great fun to watch them just being puffins. I could watch them for hours without one second being bored. 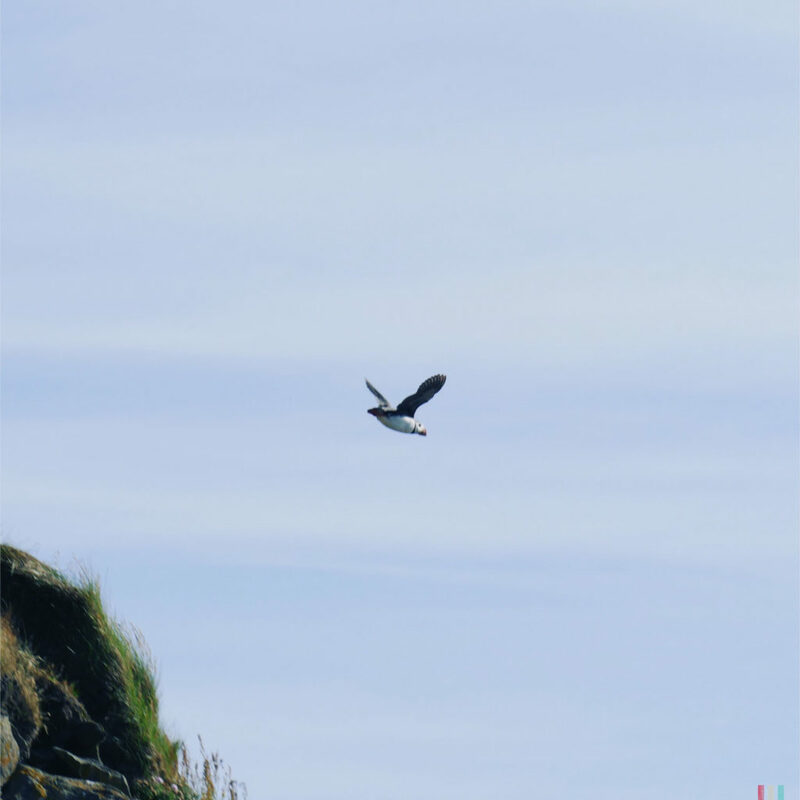 I might post a full article on puffins soon. 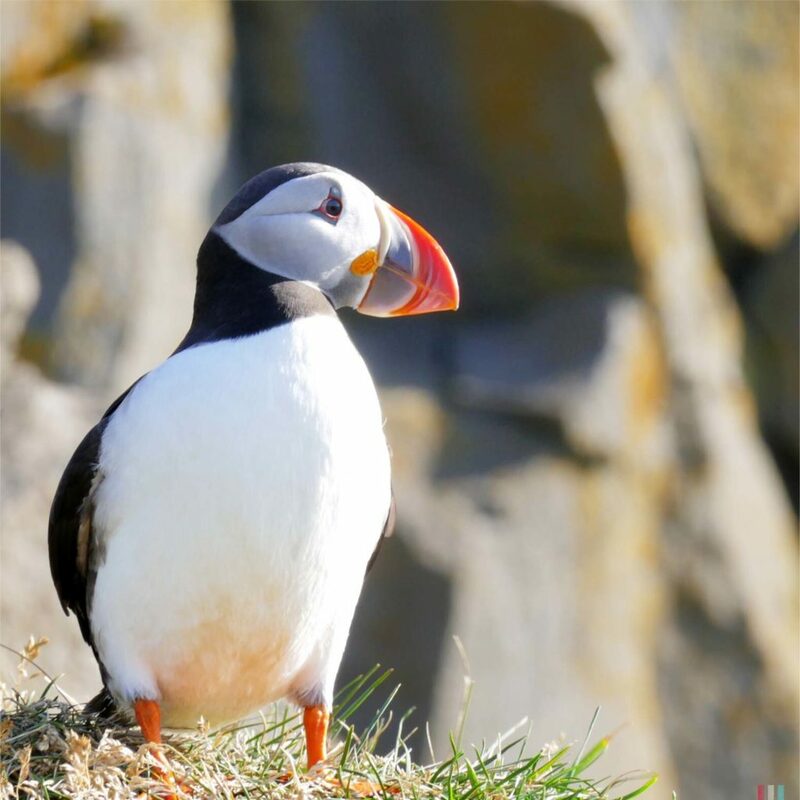 Or maybe I should rather go for a complete website only focused on puffins. We’ll see. However, not funny at all: Arctic terns. Don’t mess with them. If you ever see some sitting around at the beach: go somewhere else. Any detour is worth it. Arctic terns like to nest on the beach. And nesting arctic terns are no fun at all. I mean it. They may look small, they may look insignificant, but they are truly brave and resolute. And if you’re getting to close to their nest: they’ll attack. Immediately, with full force. A funny thing to read, but not a funny thing to witness. Things are getting worse if you come across, not knowing where the nest is. Then you go astray, trying to counter their attacks while maybe getting even closer to their nest and therefore being attacked even harder. That’s what happened to us, not just once. Nothing to laugh about. I’ve seen videos with angry arctic terns charging even a hungry polar bear. And those videos weren’t too long, the polar bear quickly fled under these furious attacks. A bit later I found some tips on the internet how to react to an arctic terns attack: just lift your backpack or any other solid (!) 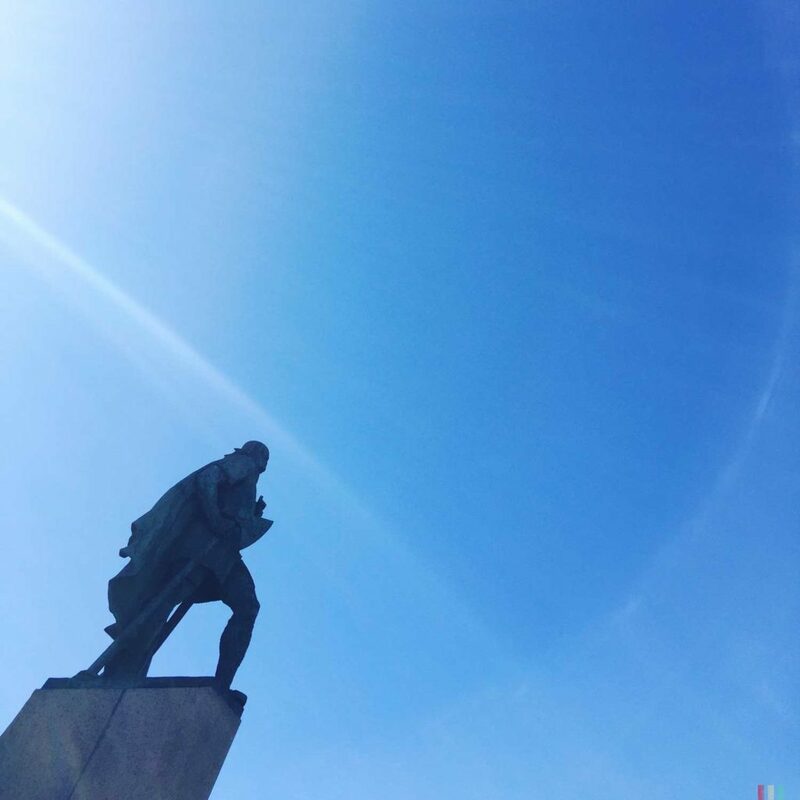 object high above your head. Arctic terns will always attack your highest point. But how would a polar bear know such things. 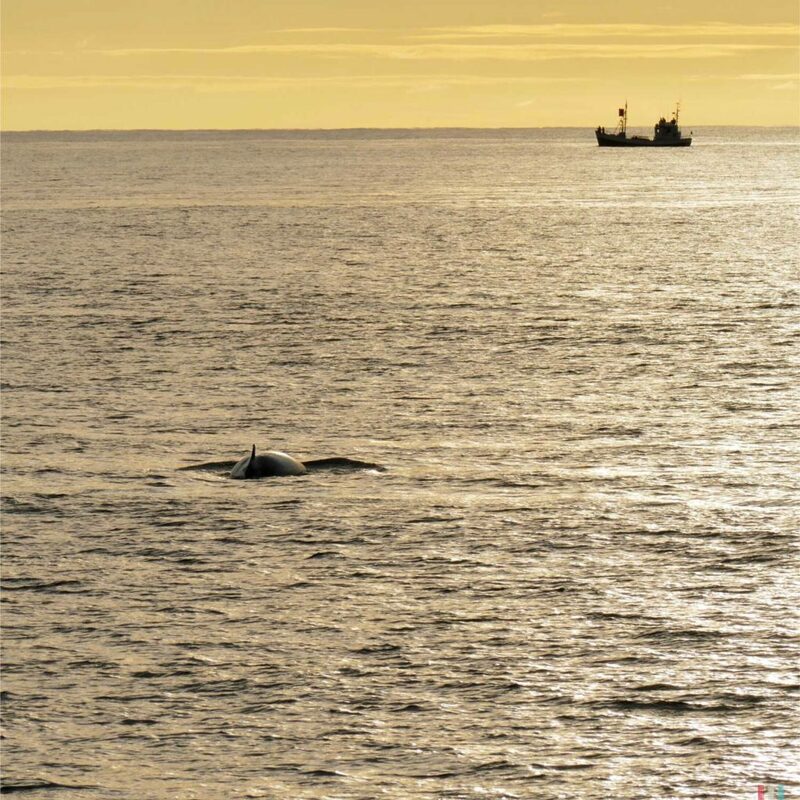 A humpback whale at Skjalfandi Bay off Husavik. It’s about ten o’clock in the evening. 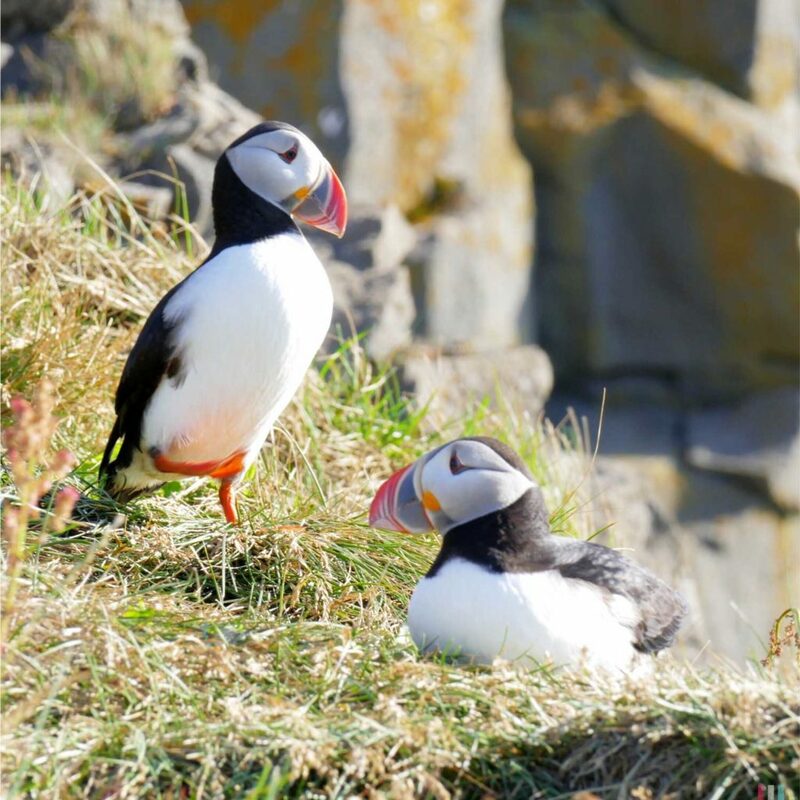 The northern part of Iceland is the whale watching hot spot. 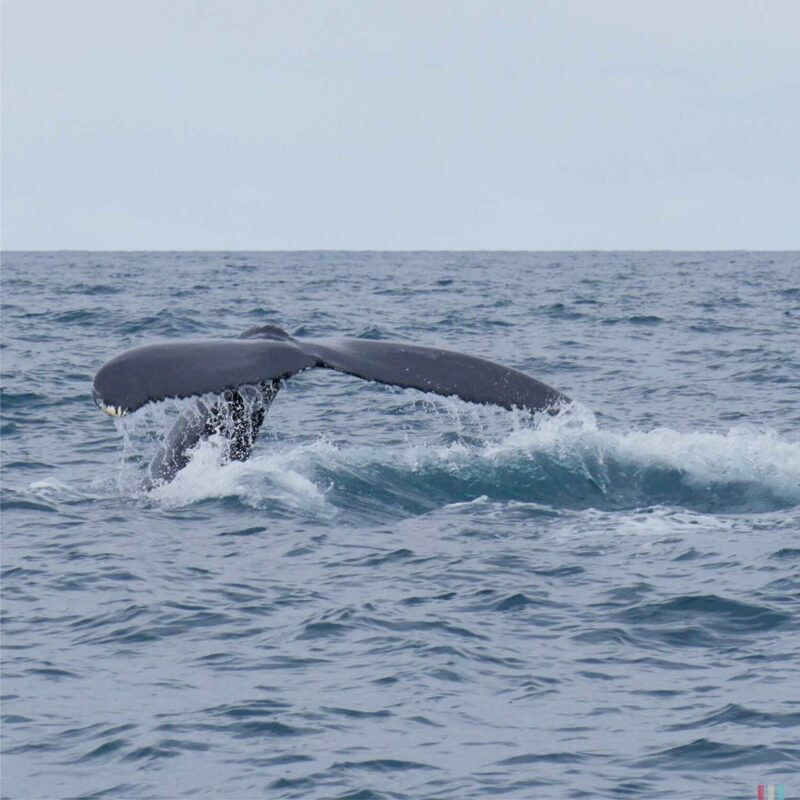 The inlets and bays are full of whales. 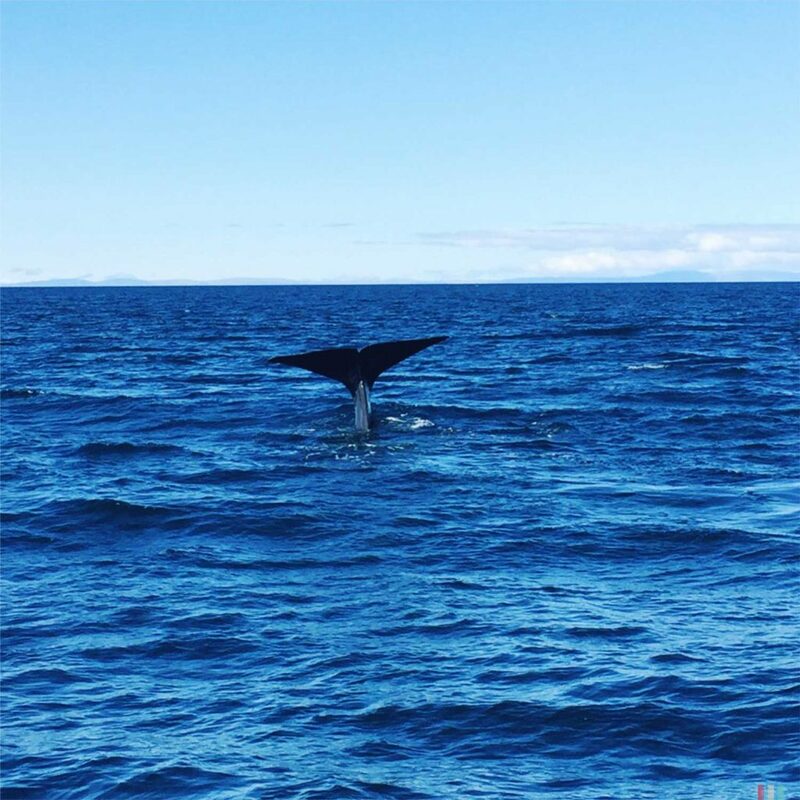 There are many great places for whale watching in Iceland, such as Reykjavik and Olafsvik in the western part or Husavik, Akureyri, Dalvik or Hauganes in the north. 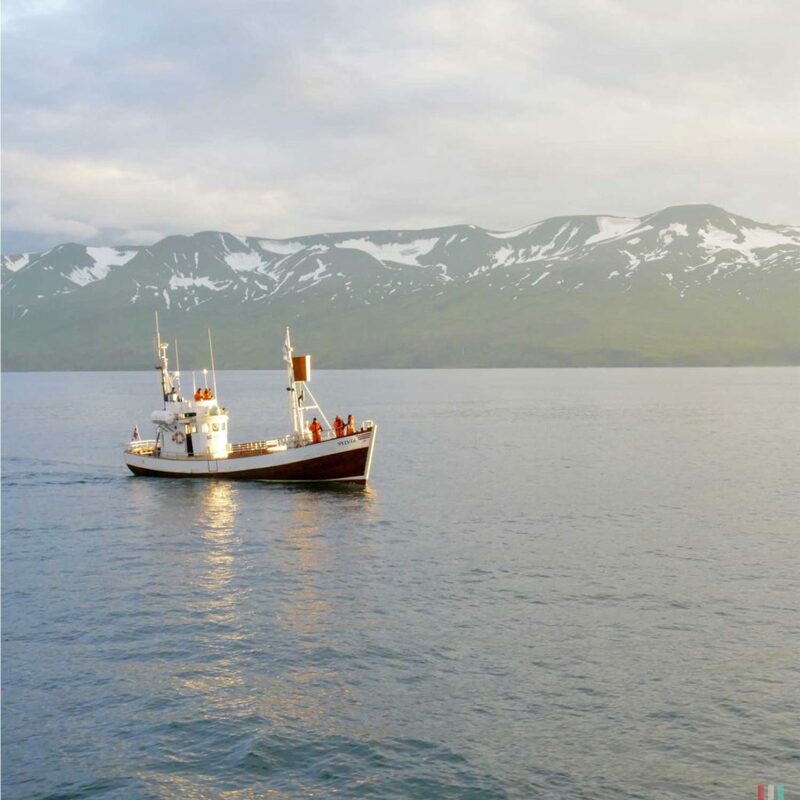 Husavik is the farthest north, that’s why you have the longest days there. 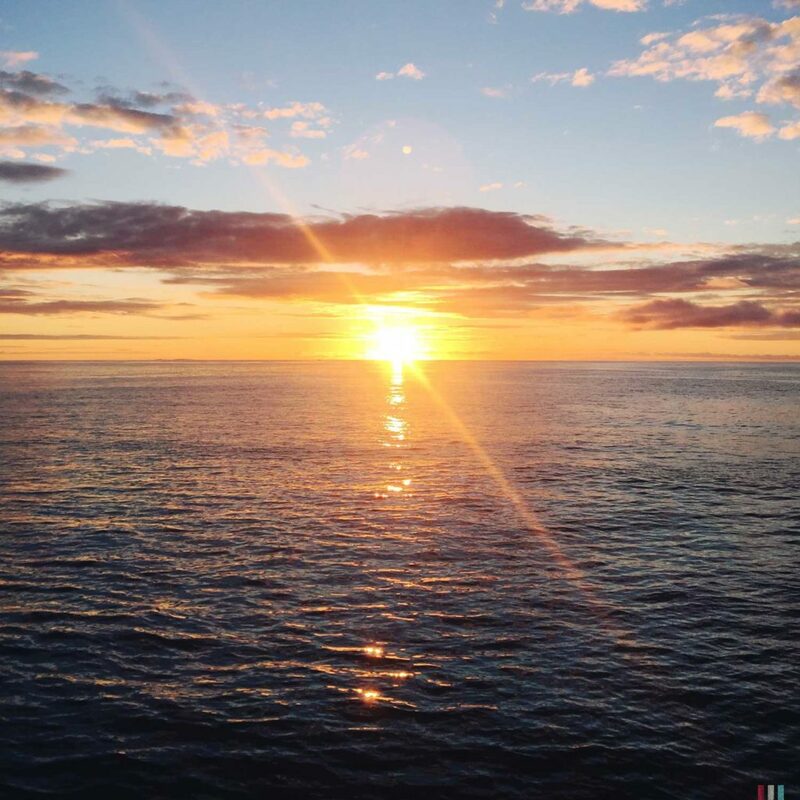 And it’s really stunning to go out in an old wooden boat at ten o’clock in the evening, still enjoying the full sun. 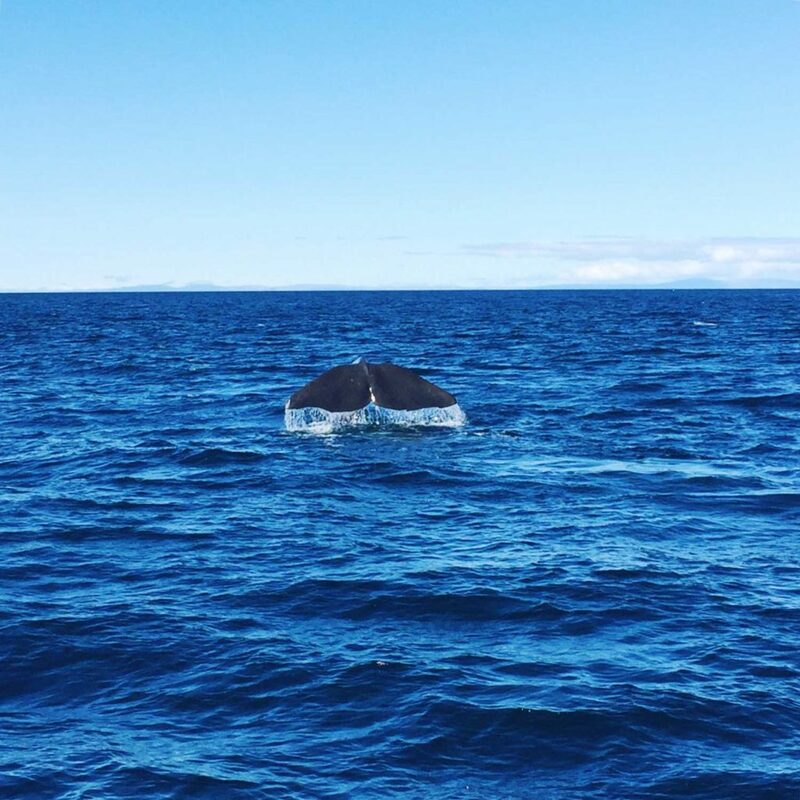 We stayed for some days and saw whales on every tour. 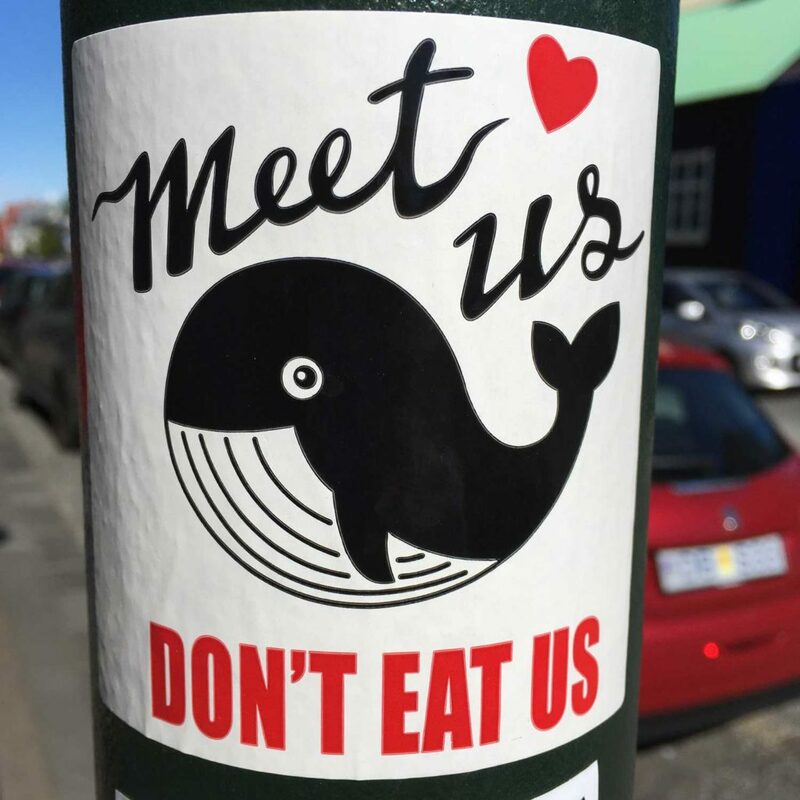 And everything in this beautiful little village is about whales. Just perfect! 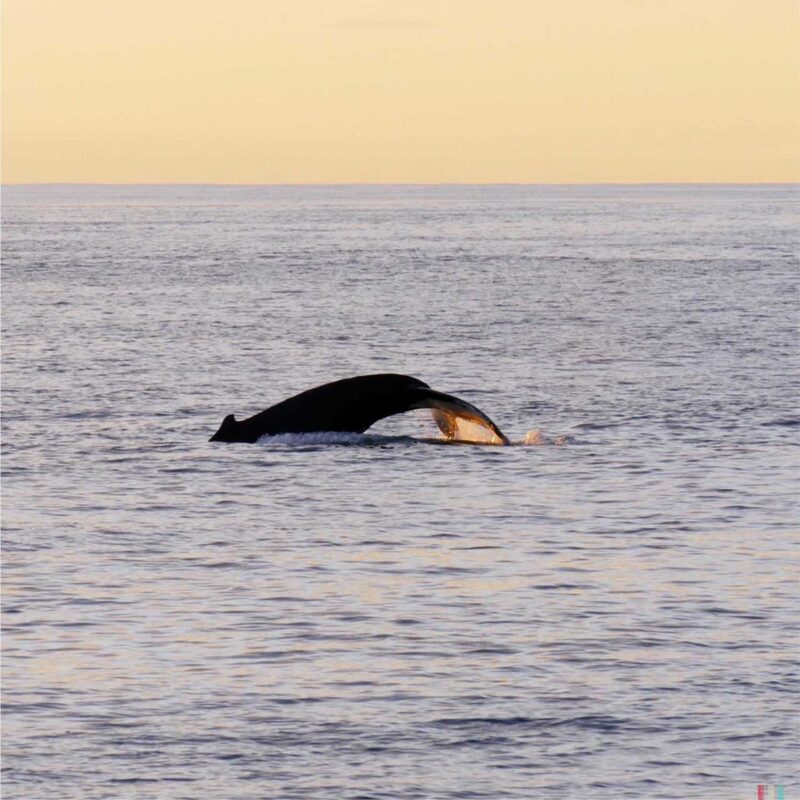 During summer, a lot of humpbacks and minke whales stay around Skjalfandi Bay to feed before they migrate back south to give birth during winter. 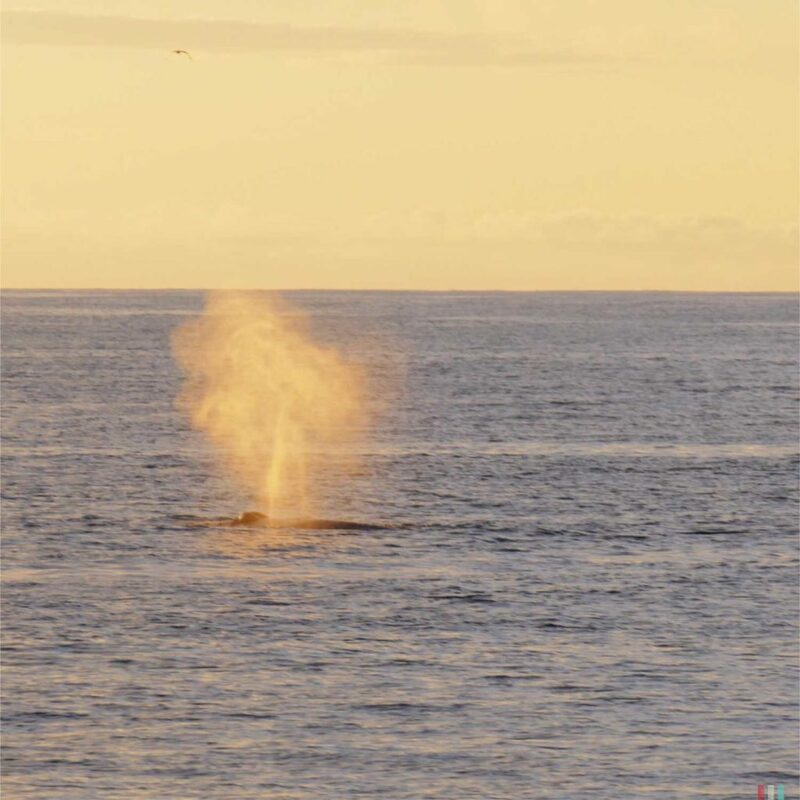 In early and late summer you have even good chances of seeing blue whales here! 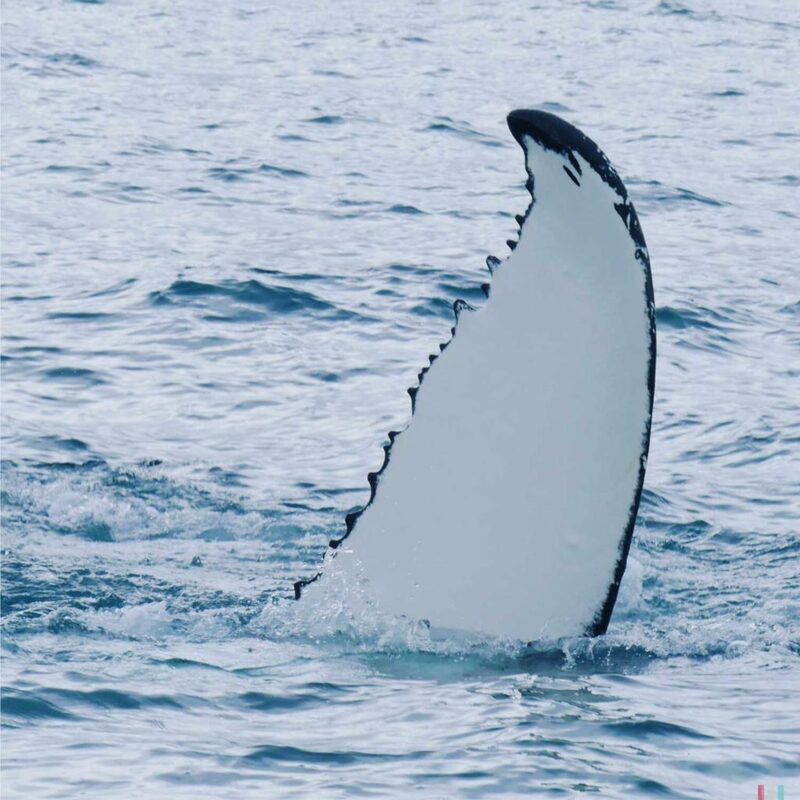 The back of a humpback. Sadly, we missed the blues by a week. 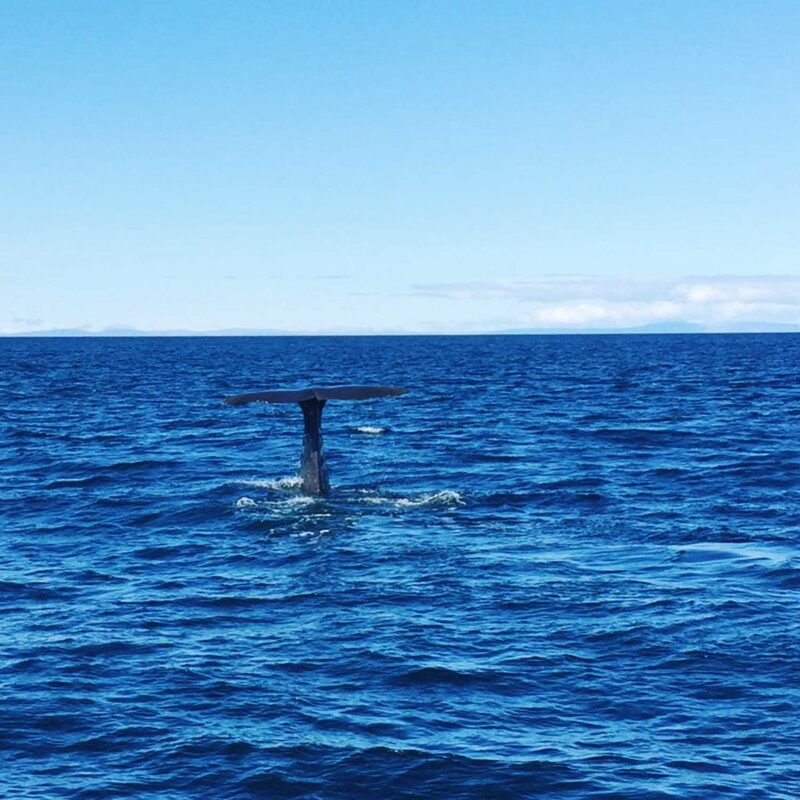 A few days after we’d left Husavik we saw a posting on Facebook saying that a group of blue whales recently came to Husavik. And they stayed there for about ten days. Bad luck. 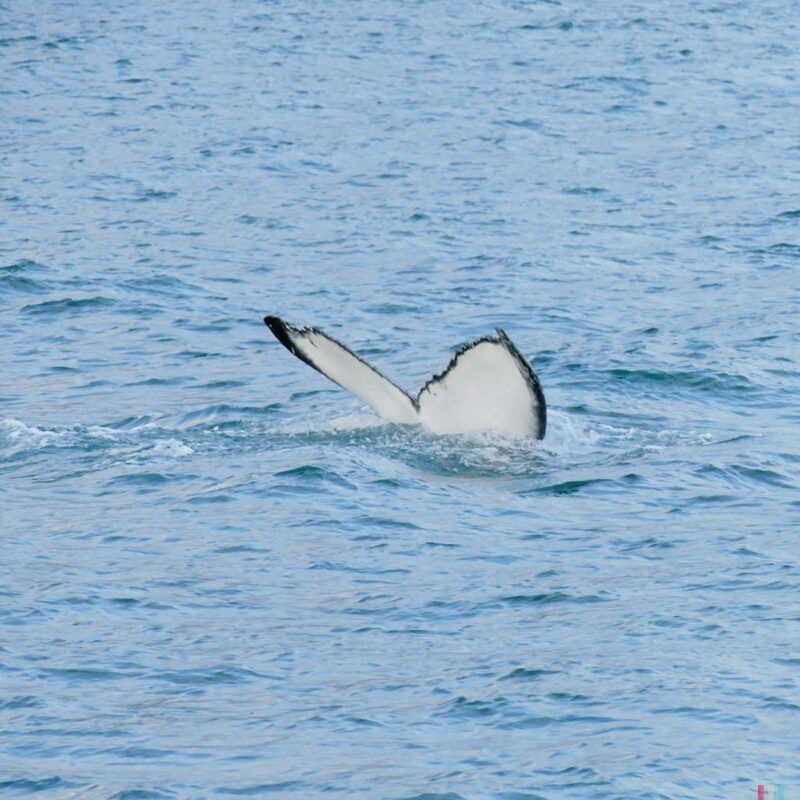 Instead, we met an ever breaching humpback in Akureyri. This guy was so motivated, breaching and breaching and breaching. And even though I really got his rhythm after some sequences, I was not able at all to get at least one sharp and proper photo. There’s so much more to learn. We’ll be back! 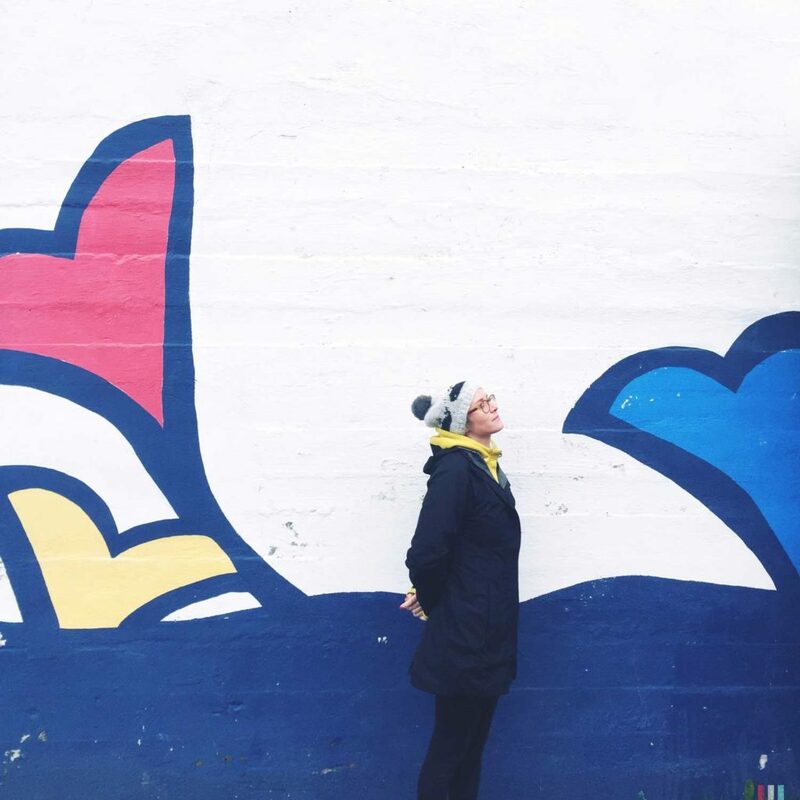 Theresa in front of the whale museum in Husavik. 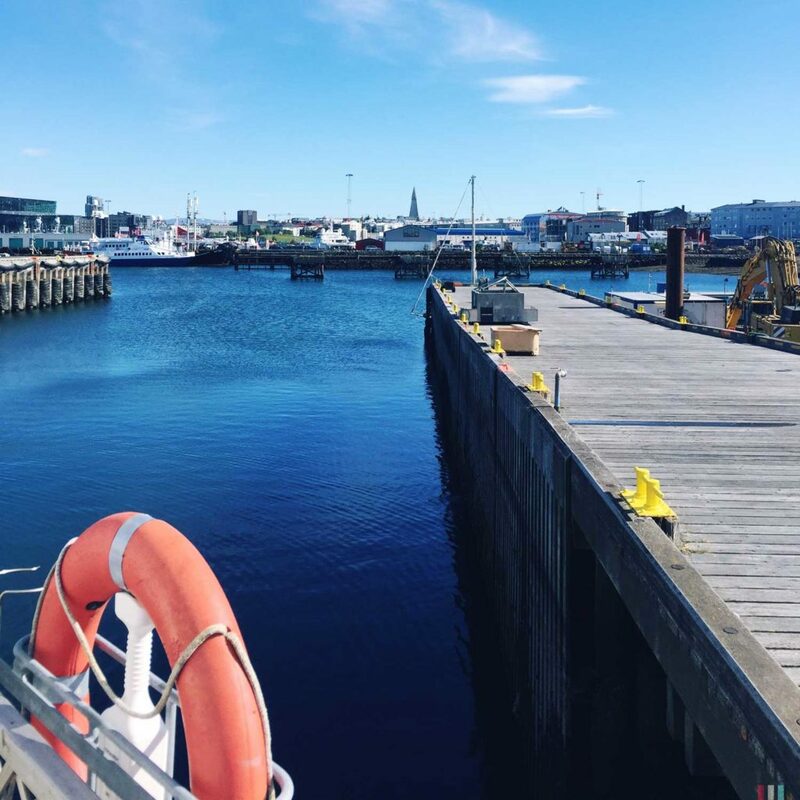 Iceland is not just the perfect place for whale watching but also for whale museums and exhibitions. It’s always hard to imagine how big a whale really is. You have books, you have the internet, yes, and you have reality. 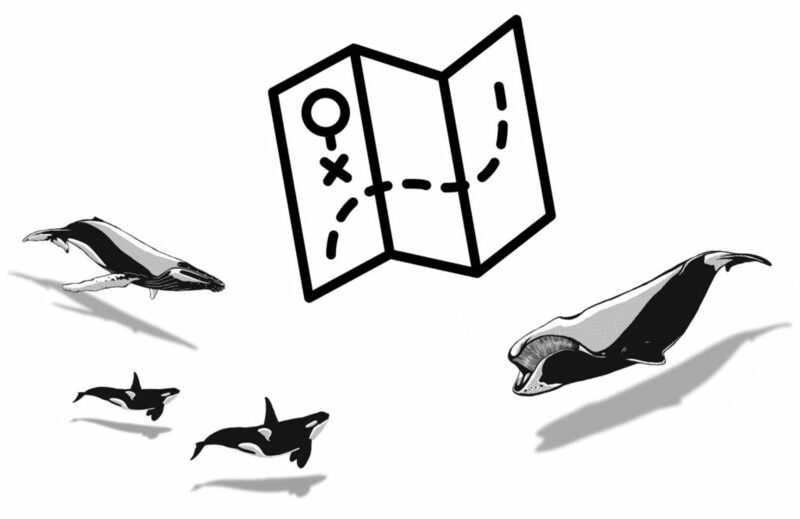 But meeting a whale somewhere out on the ocean still doesn’t solve this, as you only see a small part of the whale, most of the animal remains unrevealed, being all left to your imagination. 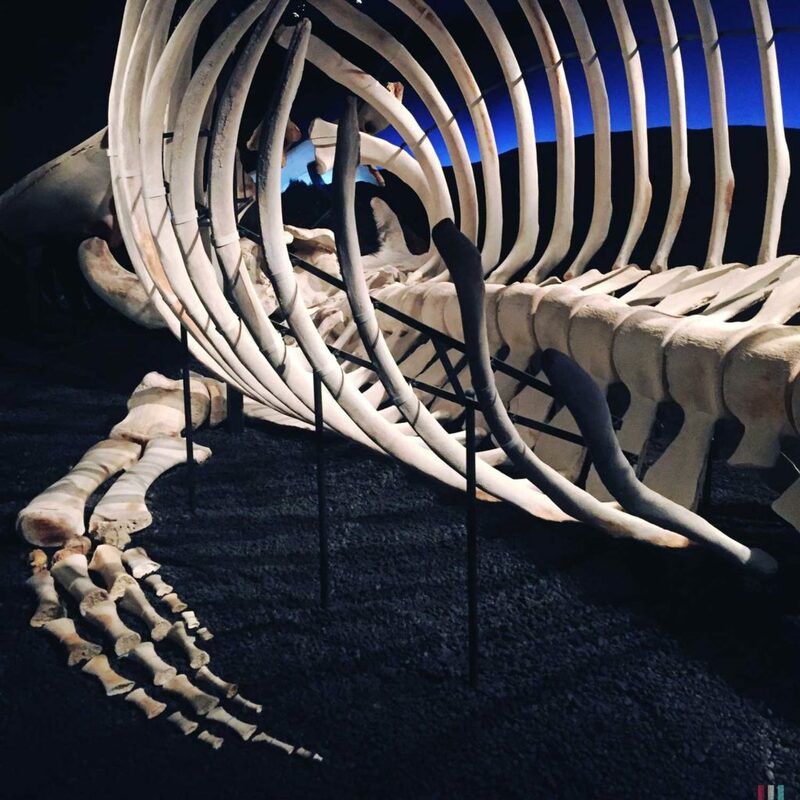 Until you enter a whale museum or a whale exhibition where you can see those full sized models and skeletons. So huge! 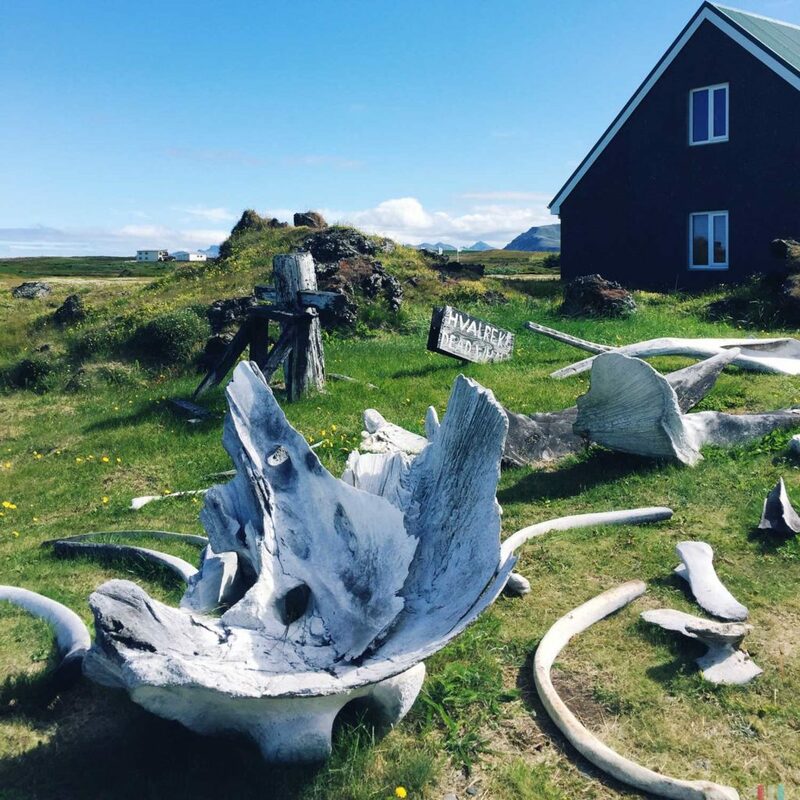 The whale museum in Husavik presents a complete skeleton of a blue whale. When you’re entering the room you run right into this gigantic jaws, a mouth so big you could park a middle class car in there. 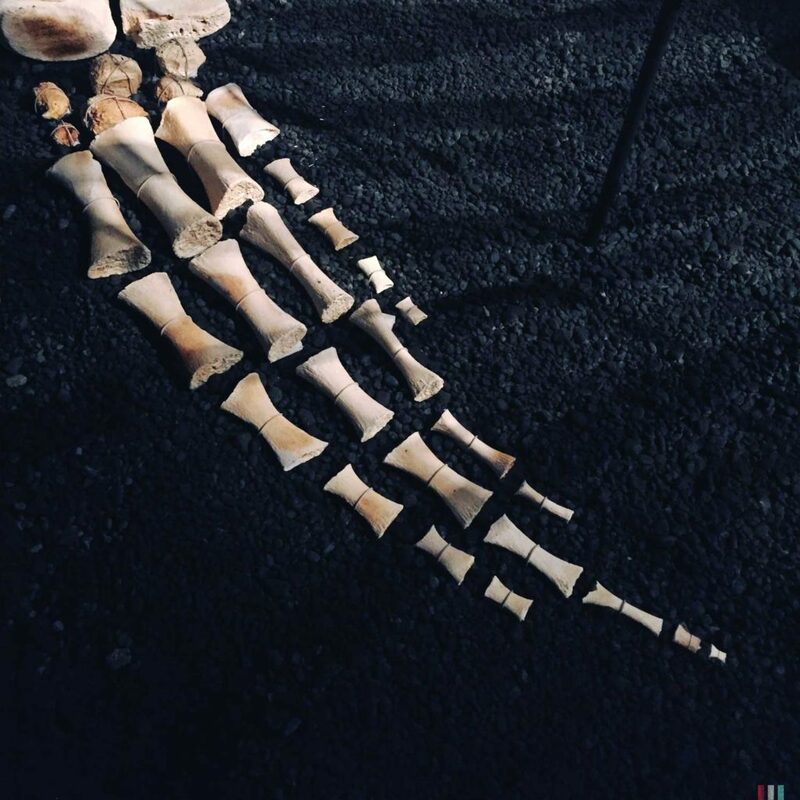 And when you walk along this skeleton, from mouth to fluke, the full 25 to 30 meters, and just count the seconds, you start to get a feeling of how long and big and huge this animal really is. Impressive! Theresa with a sperm whale. Theresa with blue whale jaws. Theresa with a full scale orca. Theresa at the whale museum. 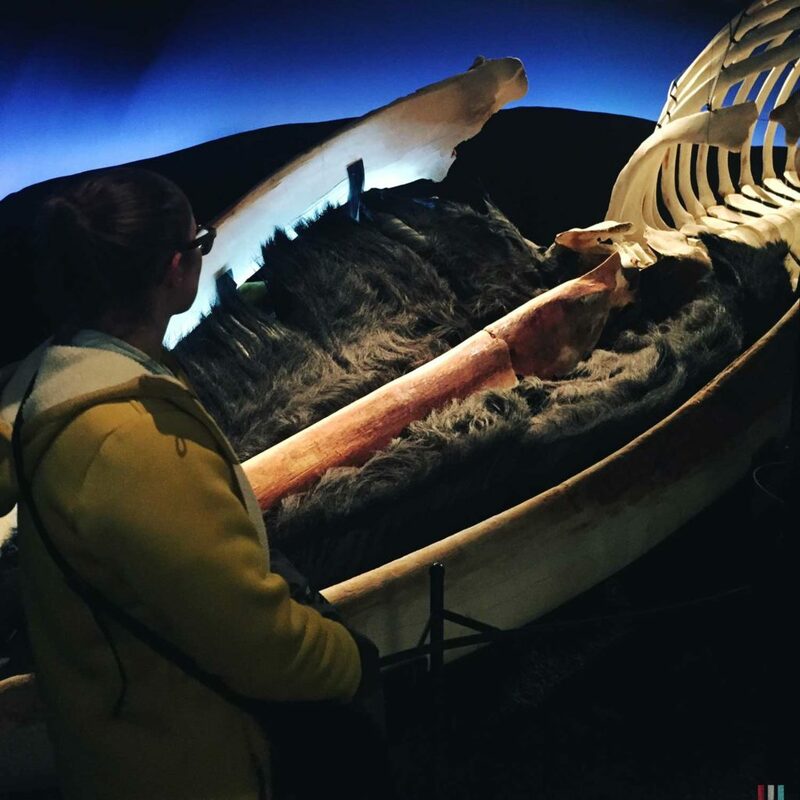 The whale exhibition in Reykjavik has a different approach: They don’t have skeletons there but full sized and colored models. And those models are so big that we found ourselves debating and debating if those models really are the accurate size or, however, maybe are a bit oversized. 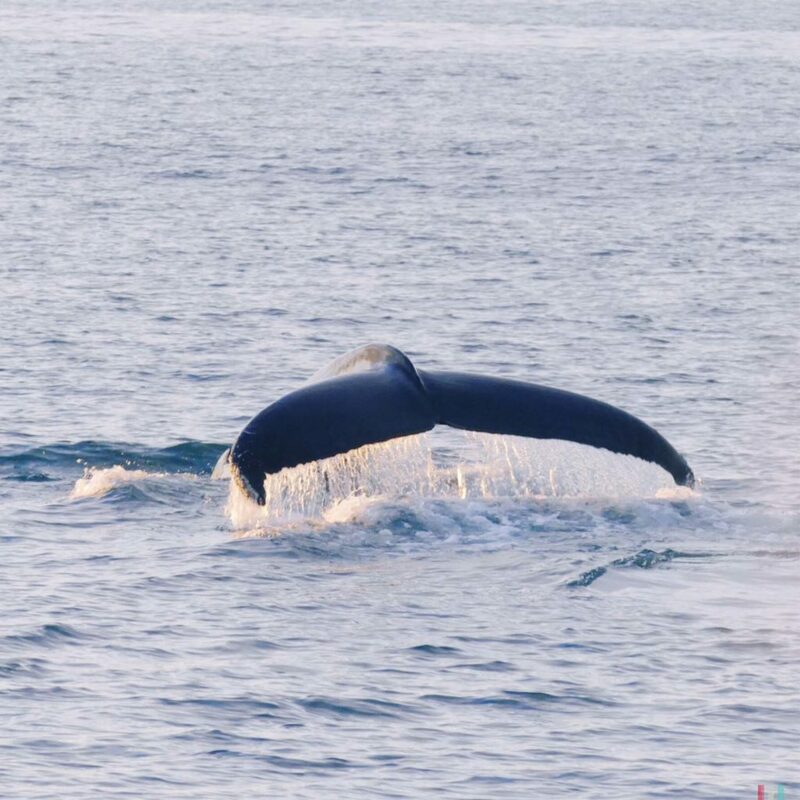 Can a regular blue whale / humpback / orca really be THAT big? Thanks to the great audio guide coming with the app you can use during your visit we’ve learned that those models really are of the accurate size. Again: impressive! And still hard to believe, though. 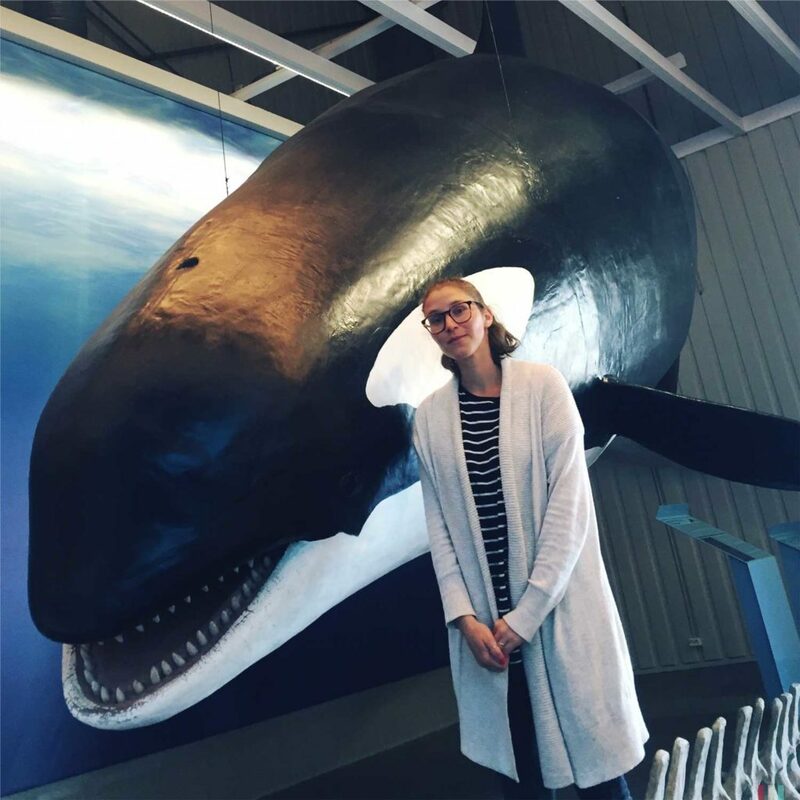 So, if you’re interested in whales, you should definitely visit a whale museum and a whale exhibition here. And after that, of course, hop on one or two or three of the many boats. So much worth the time!